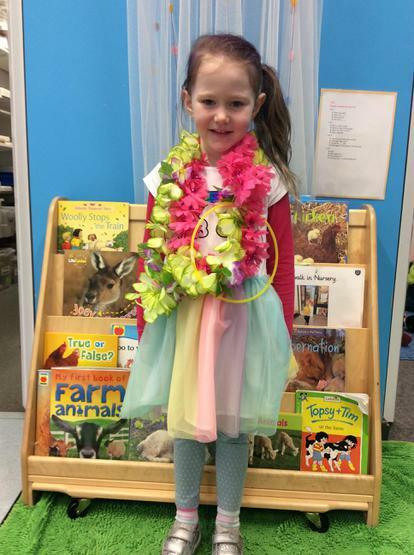 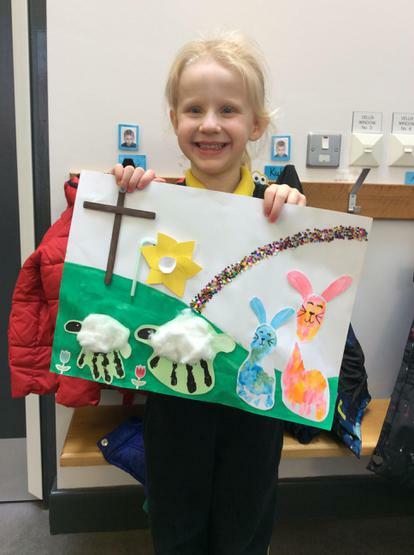 Throughout the month of March, we will be exploring the following exciting topics: Spring, Easter and the farm! 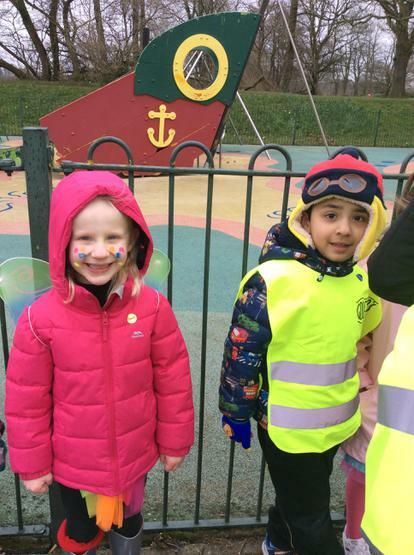 We are looking forward to exploring the new season of Spring; observing new flowers growing outdoors, reading and learning about new animals being born, as well as hopefully enjoy some warmer weather outdoors! 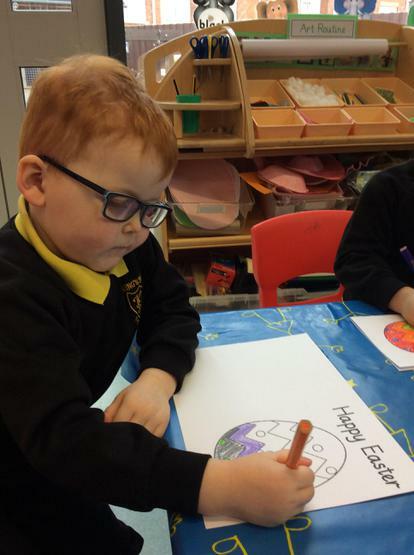 We will also be getting ready for Easter by taking part in many different fun Easter activities! 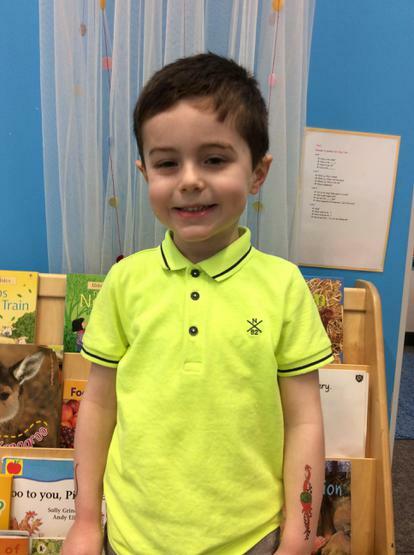 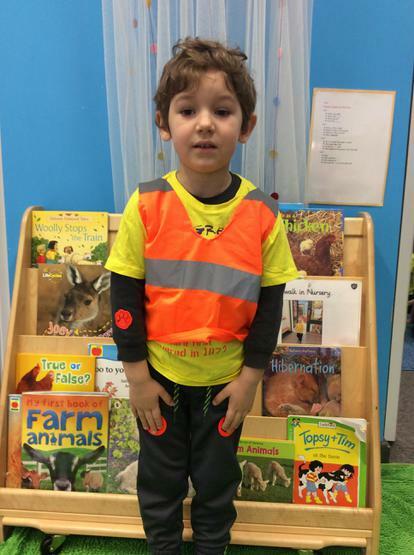 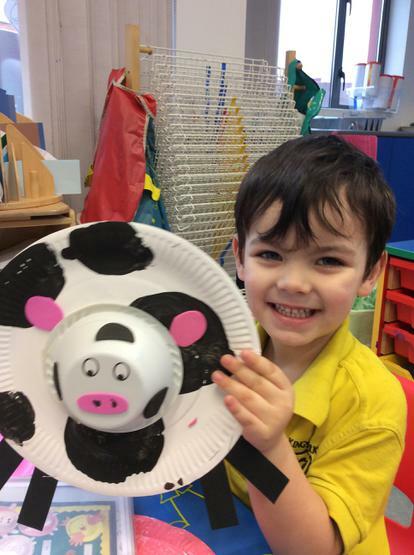 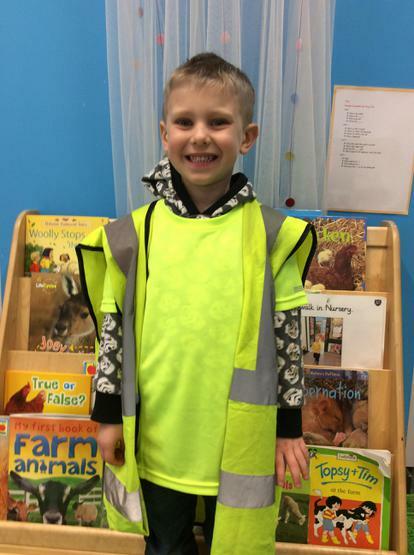 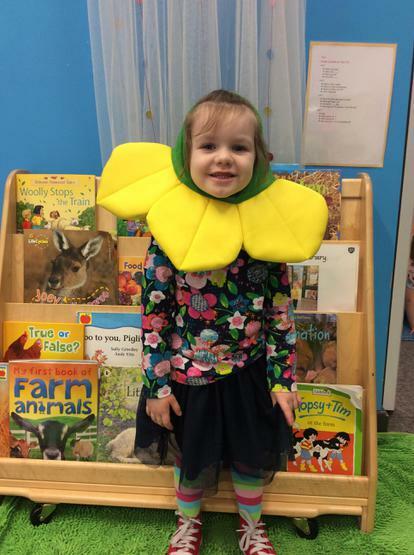 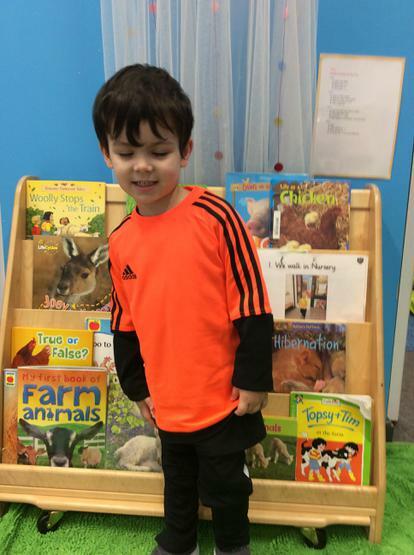 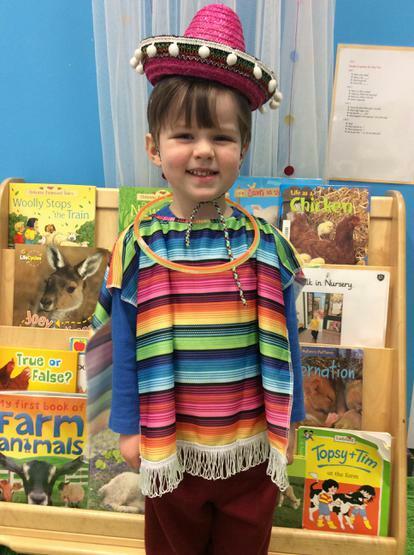 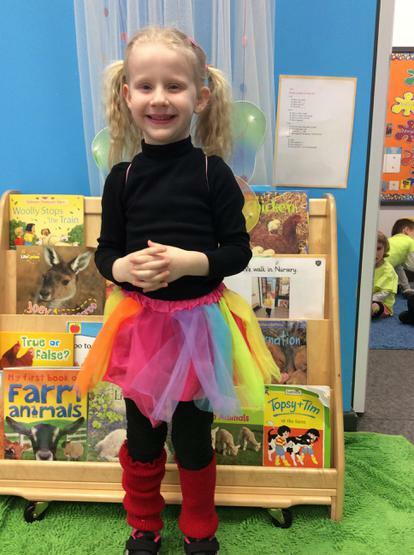 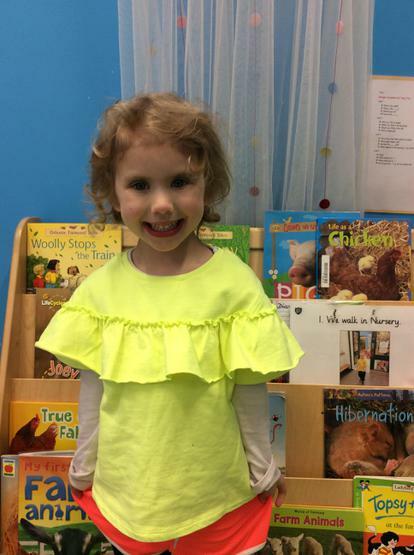 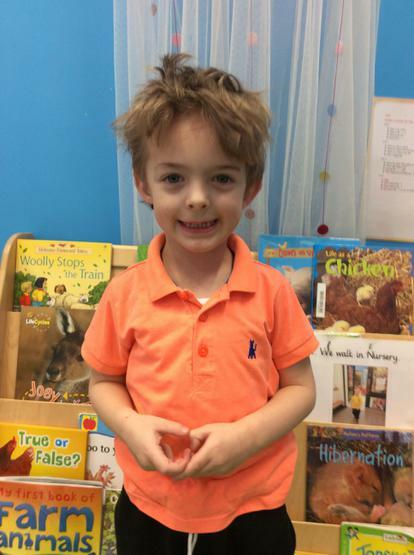 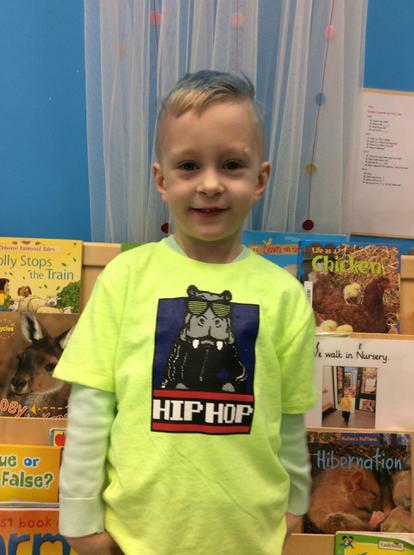 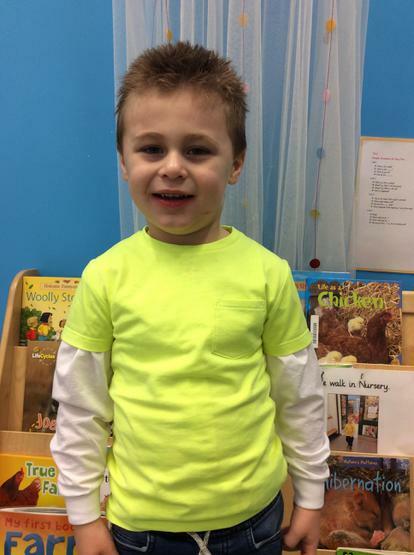 In addition to all of this, we will be learning more about the farm through our play and community time learning; naming different farm animals and talking about their bodies/features, learning about the different products they give us, as well as learn more about tractors and other farm machinery. 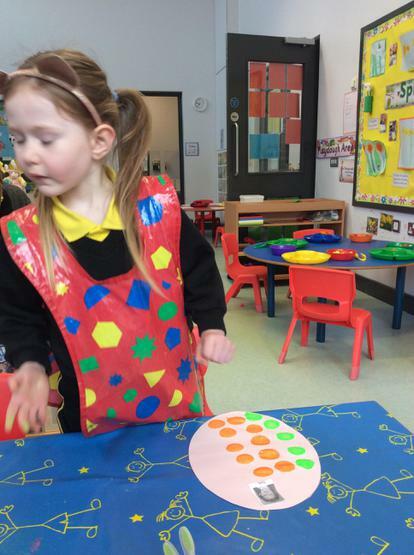 For March, our focus shape is oval and our focus colour is green! 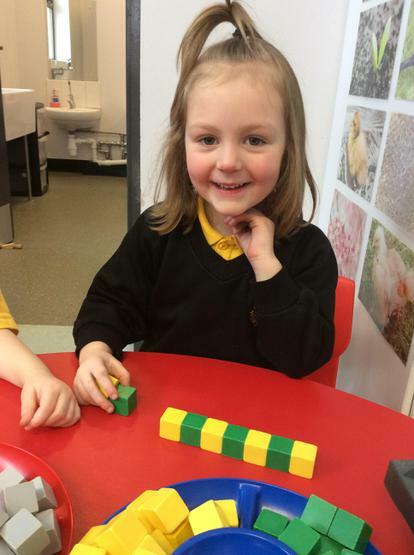 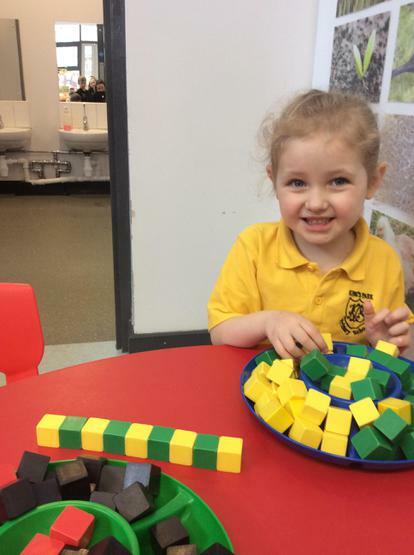 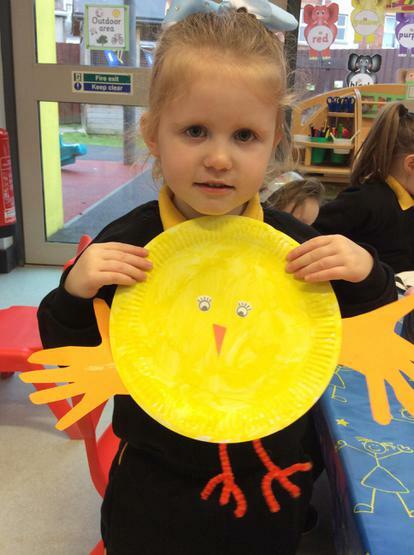 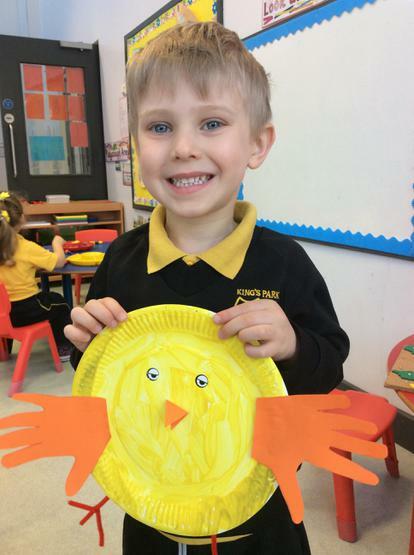 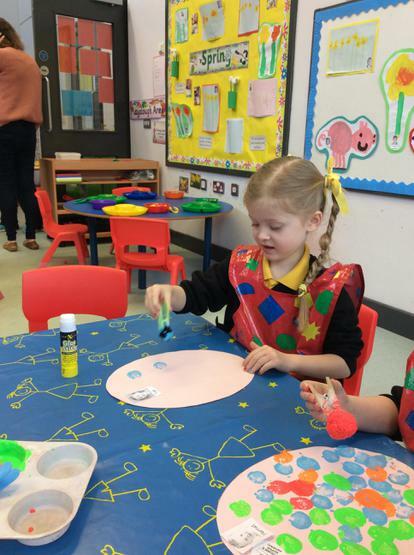 Please encourage your child to go on a shape and colour hunt around your house and outdoors and bring in one thing for our shape and colour tables (please label these objects with your child’s name and they will be returned at the end of the month). 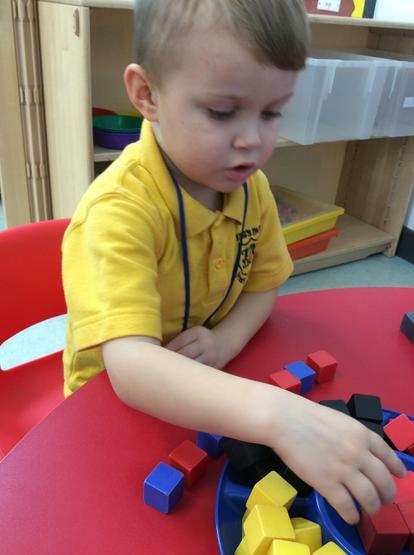 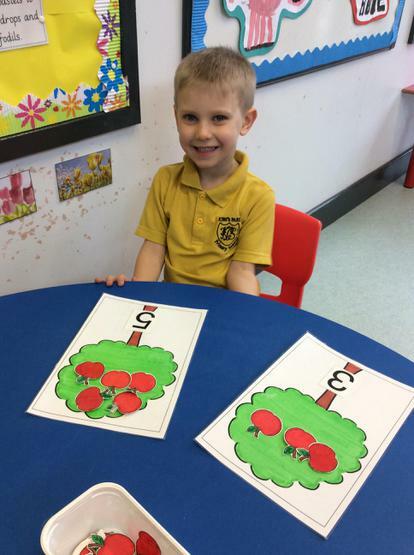 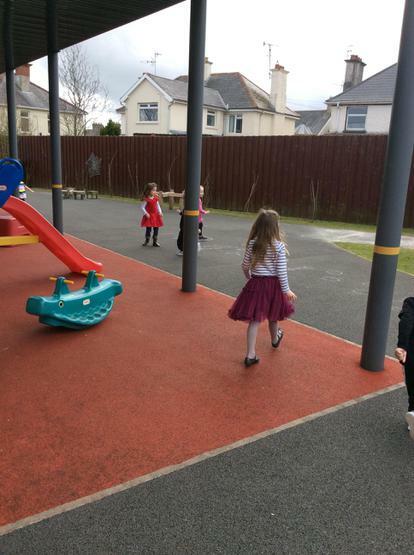 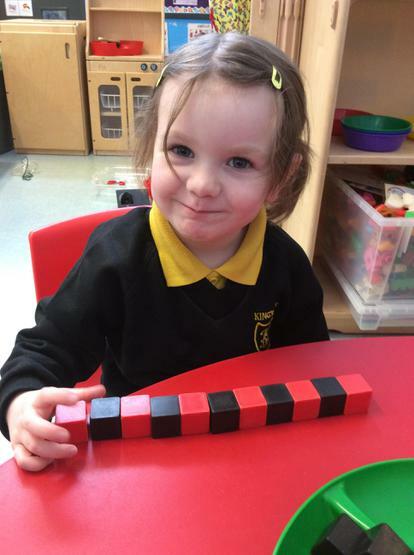 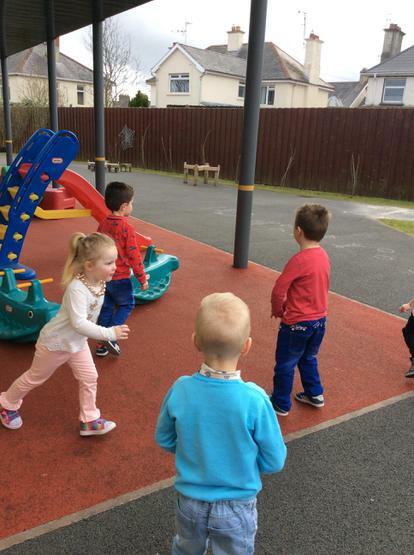 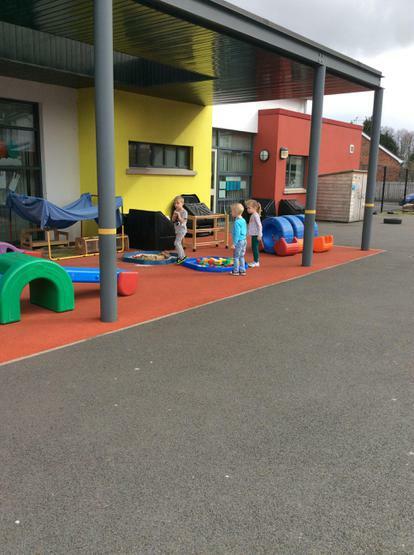 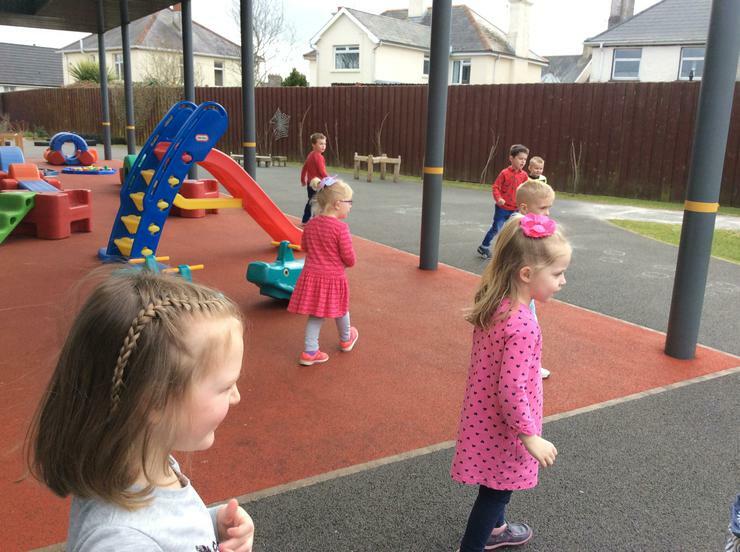 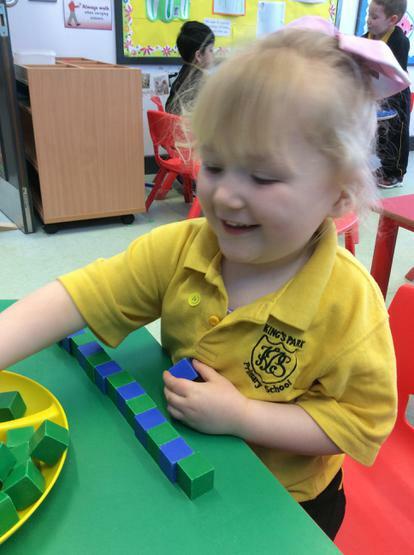 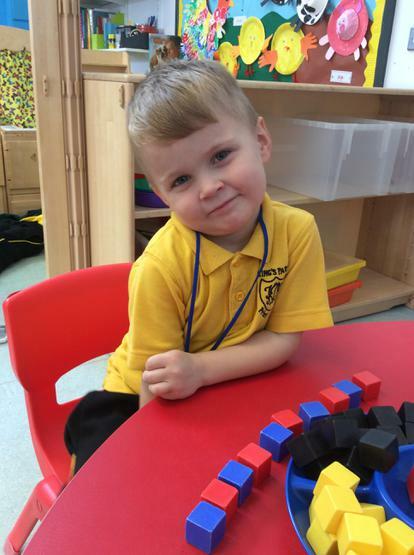 We will also be providing lots of opportunities to develop our fine and gross motor skills both indoors and outdoors, as well as become more familiar with numerals 0-5! 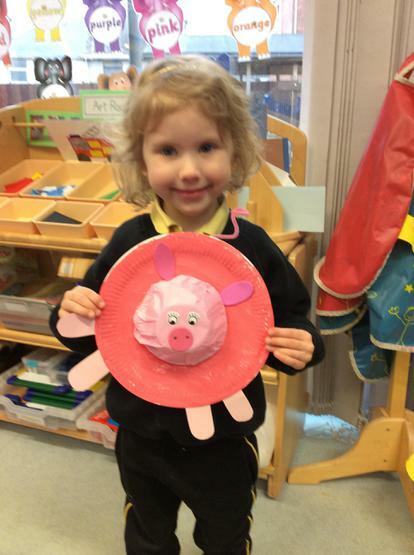 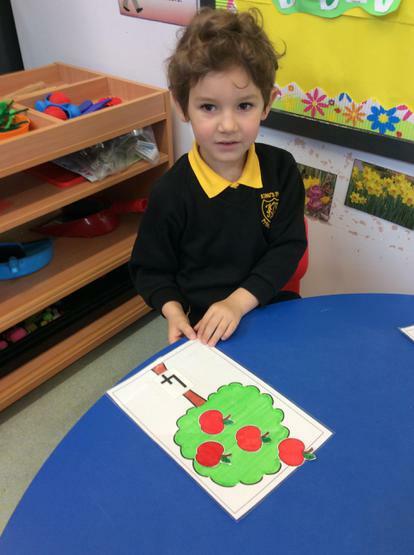 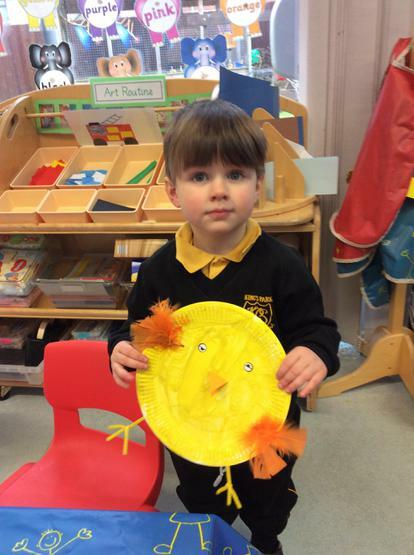 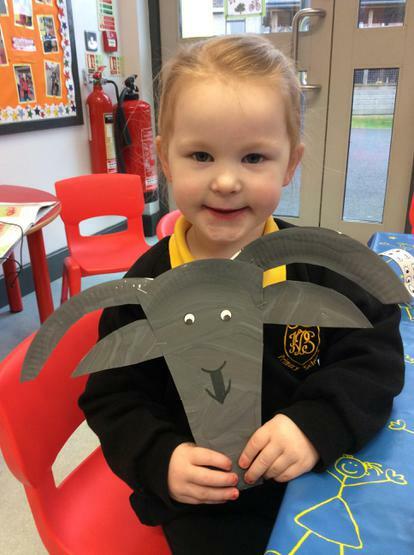 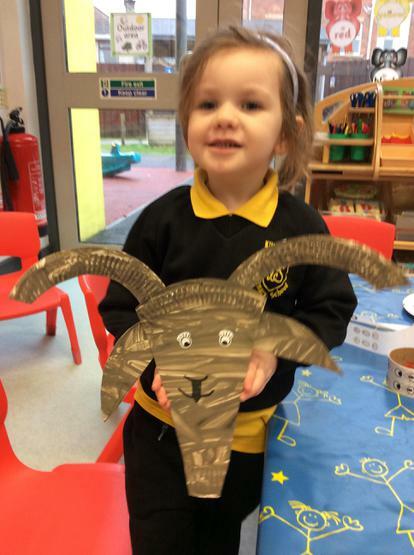 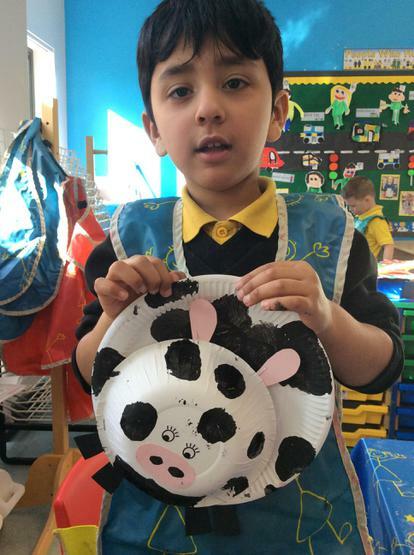 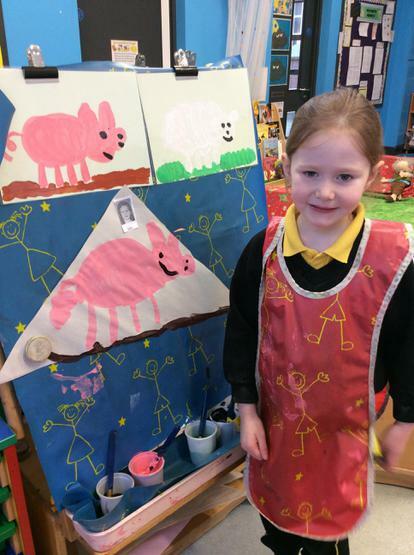 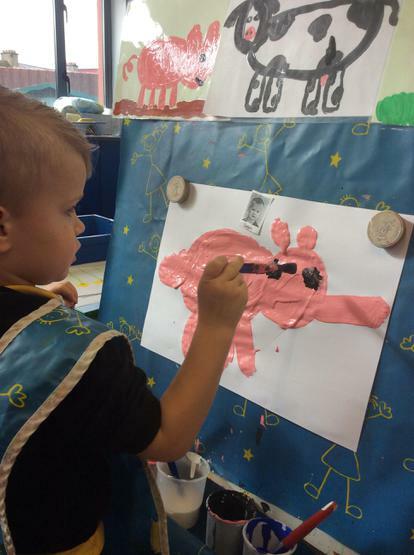 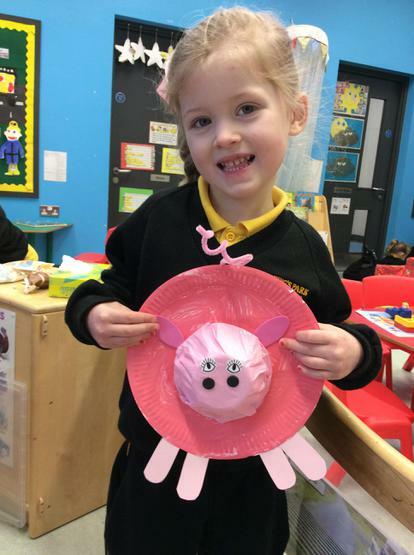 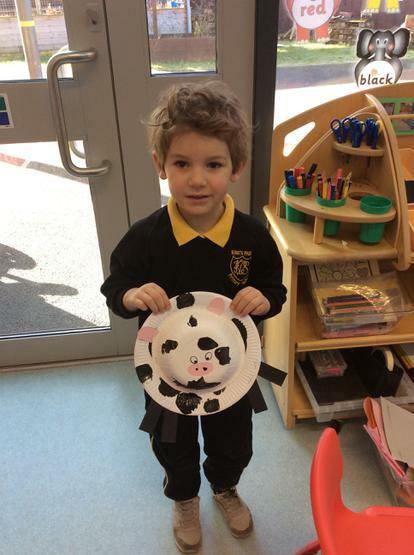 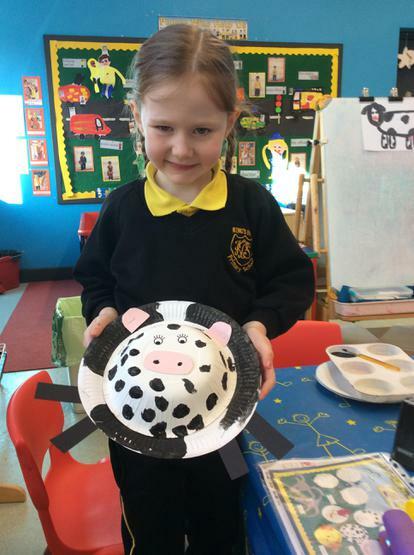 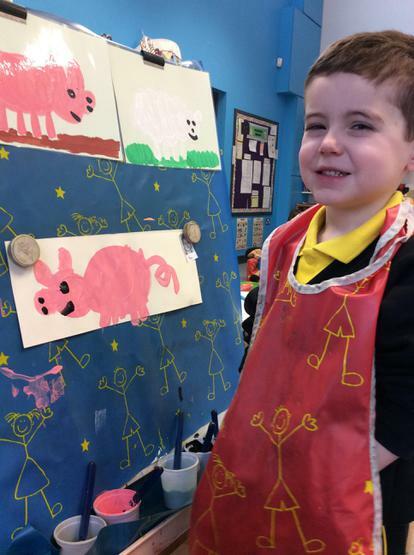 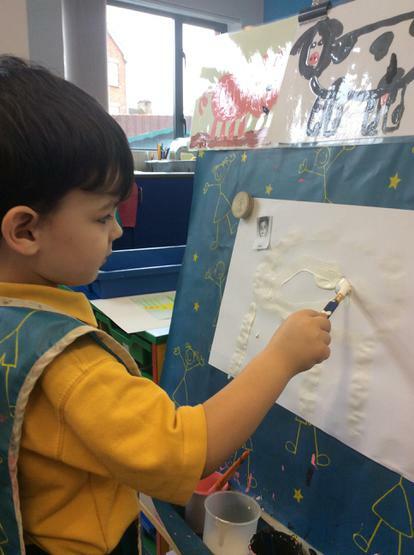 Learning more about the farm through art activities! 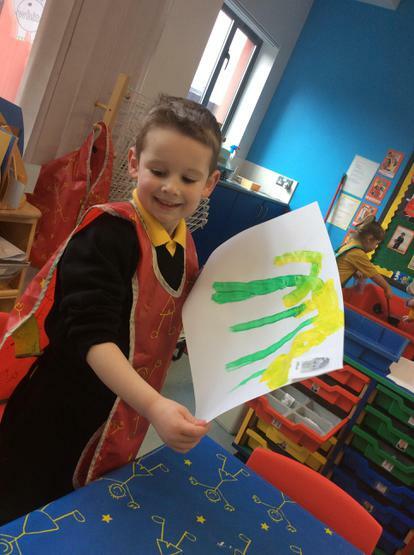 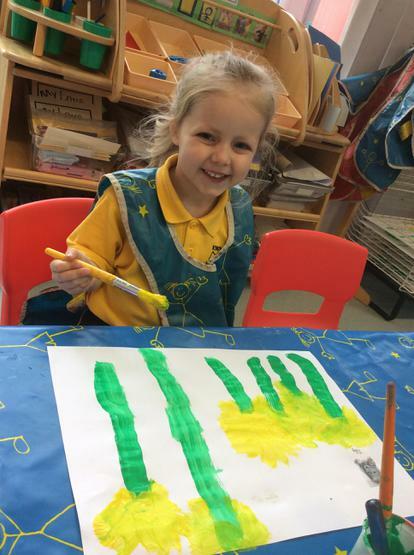 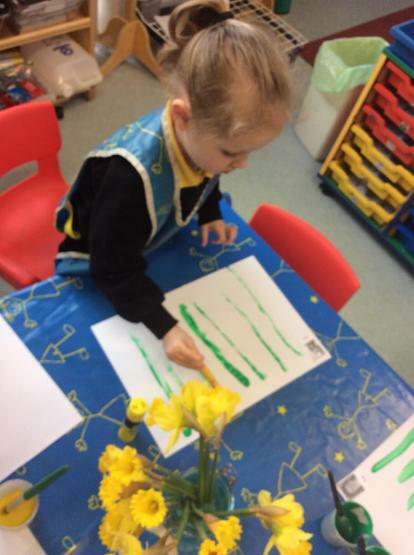 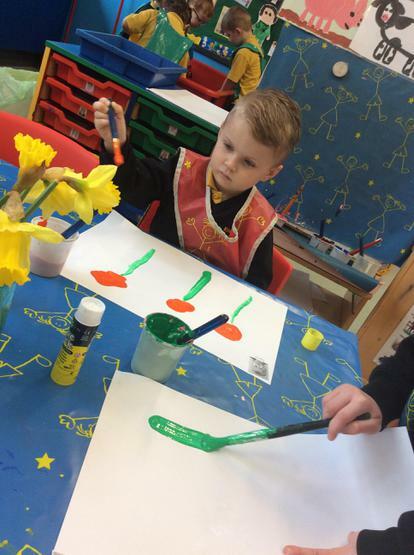 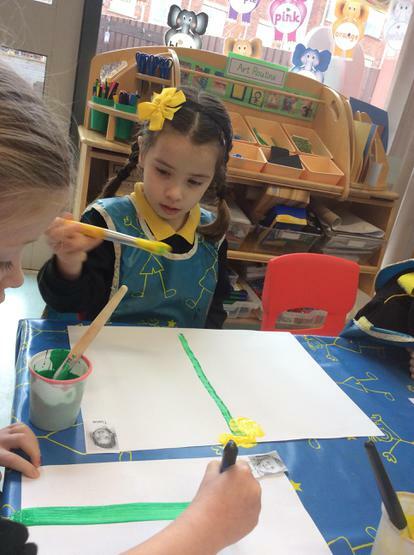 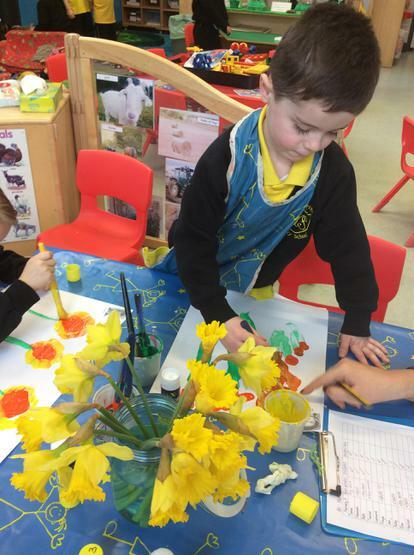 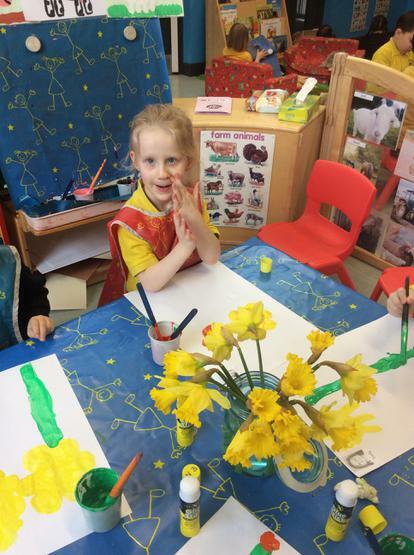 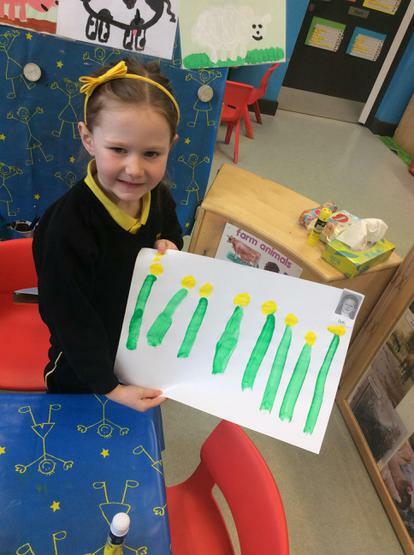 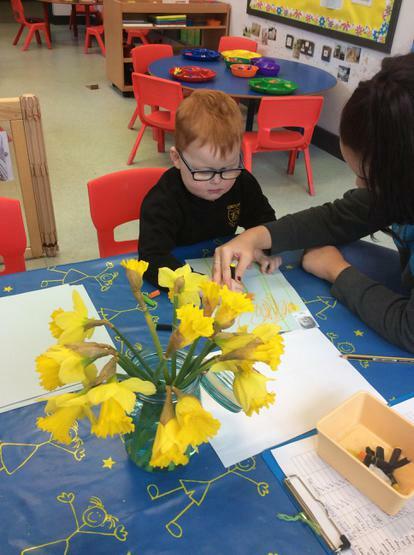 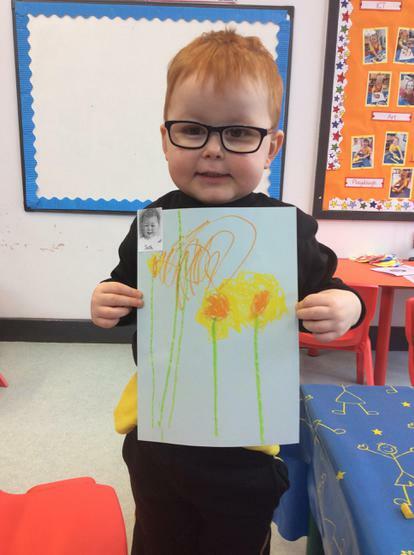 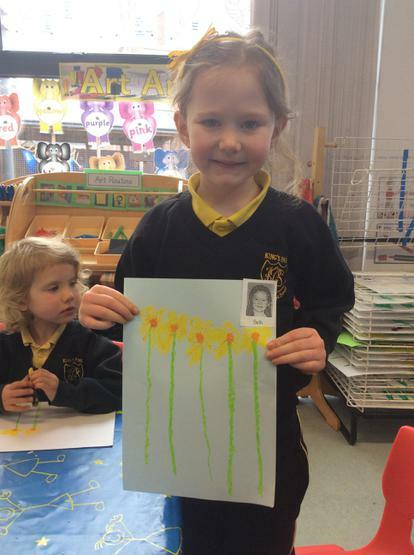 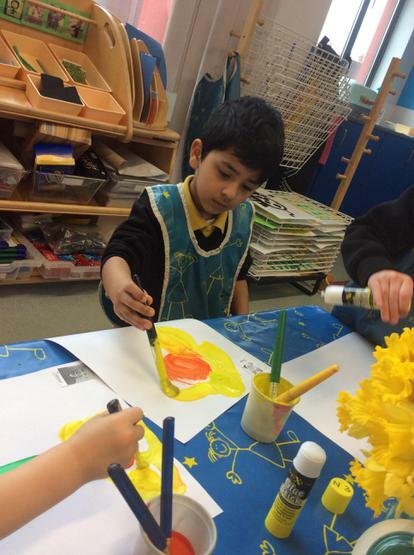 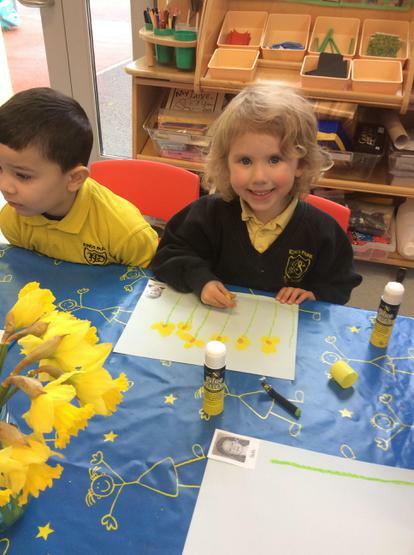 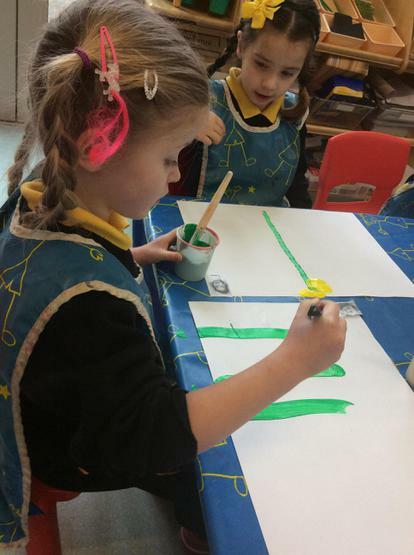 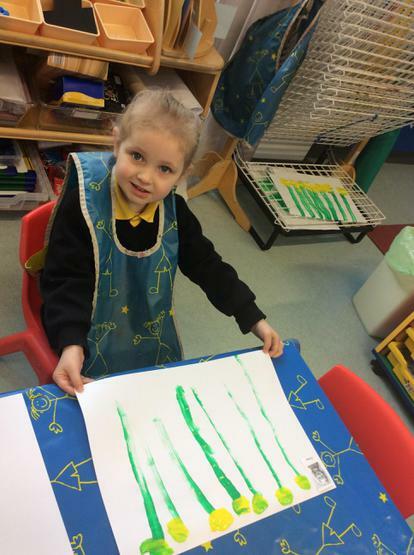 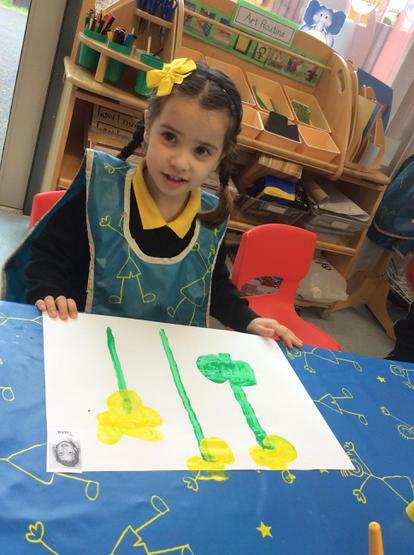 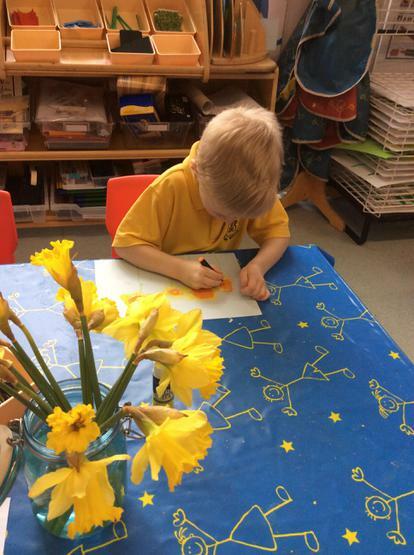 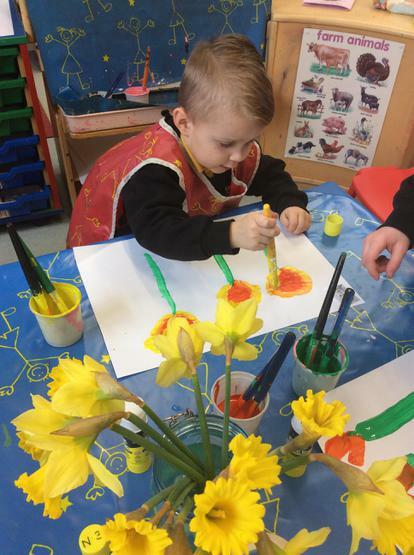 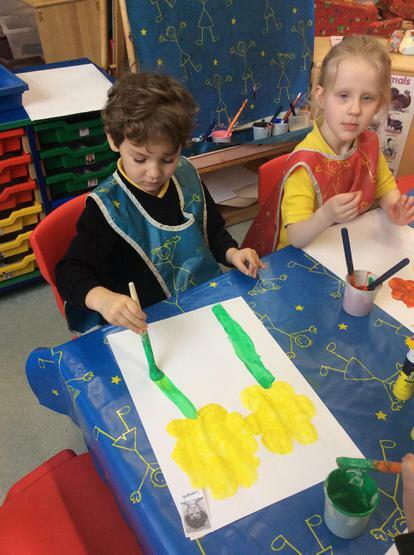 We used paint and pastels to make beautiful pictures of Spring daffodils! 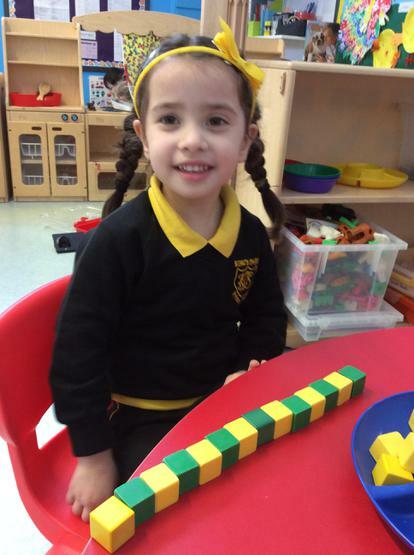 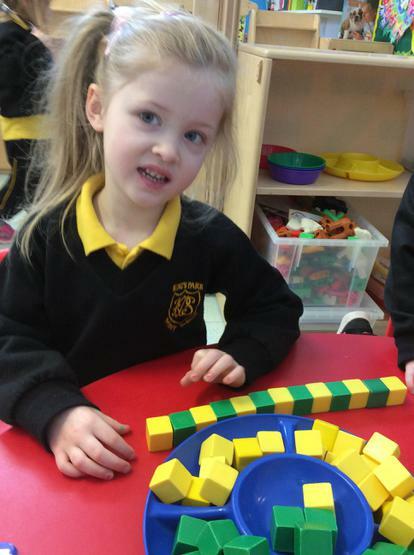 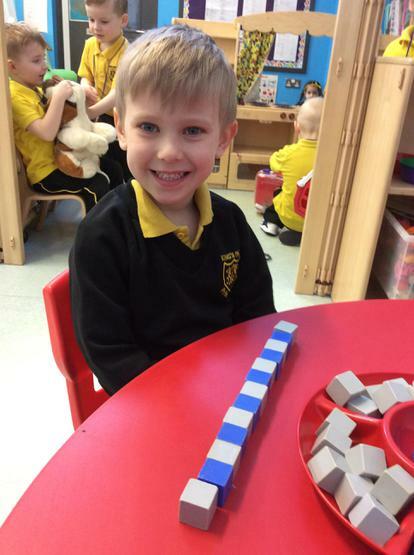 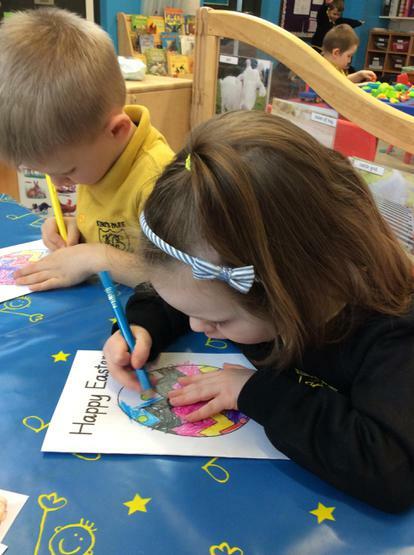 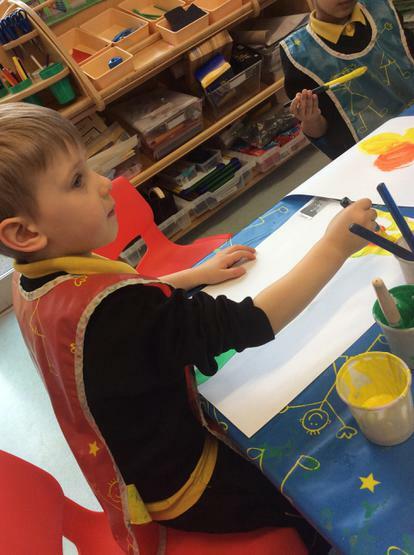 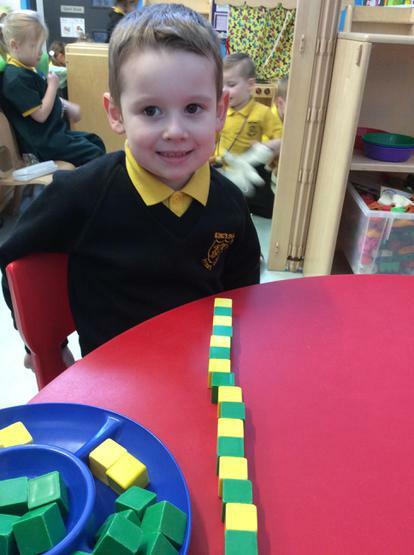 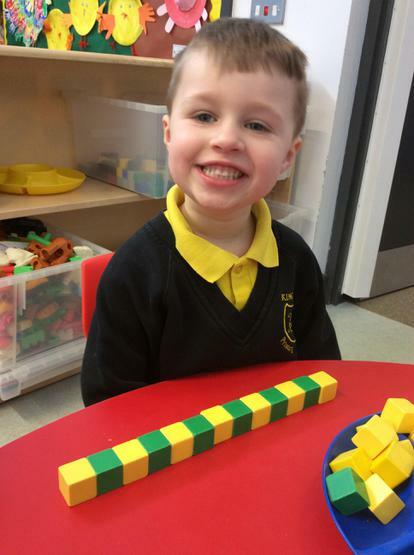 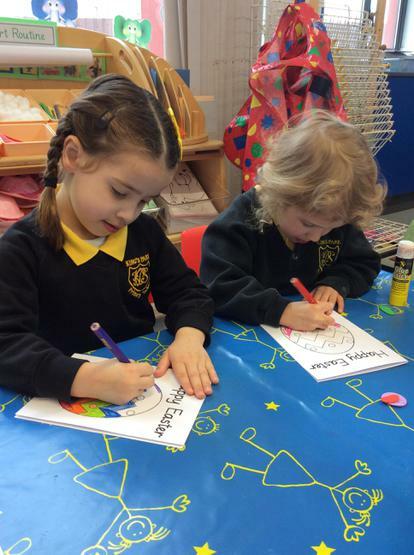 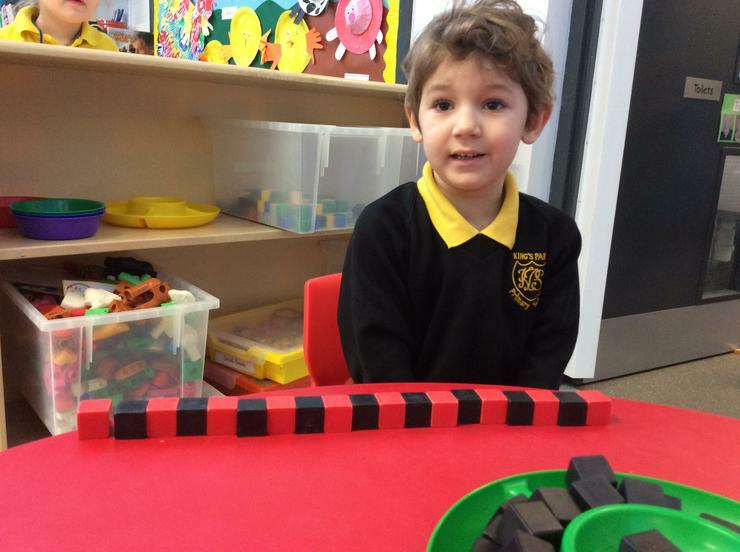 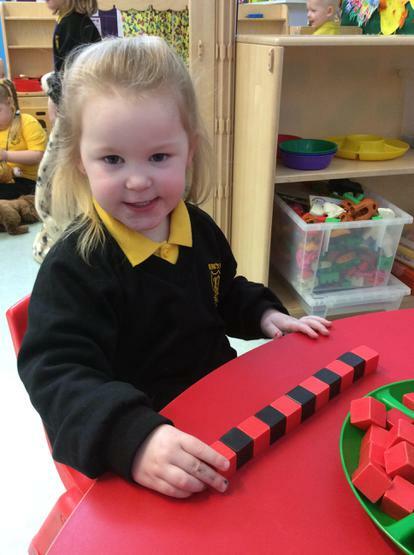 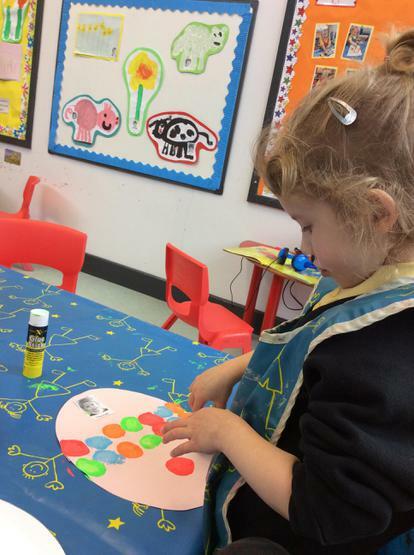 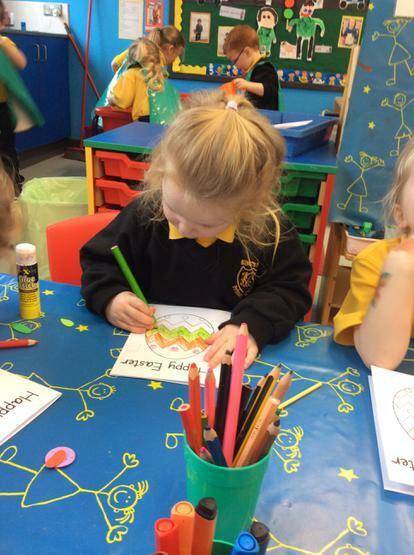 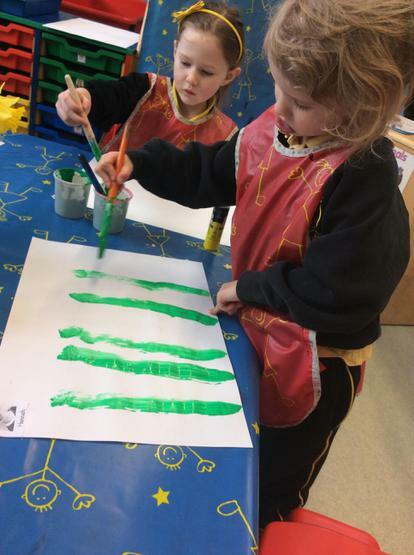 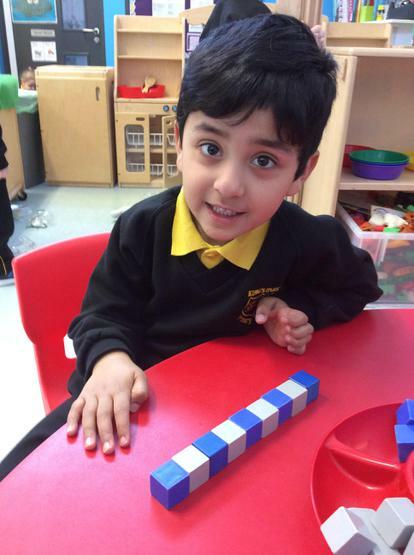 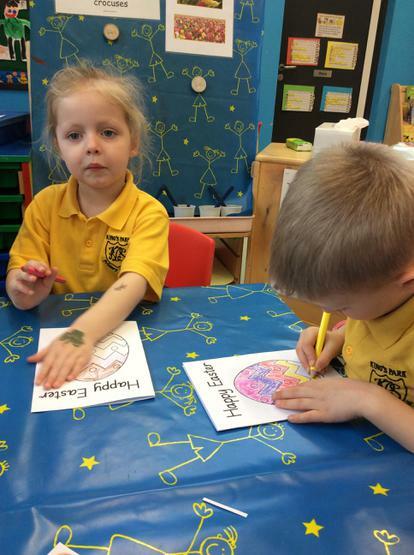 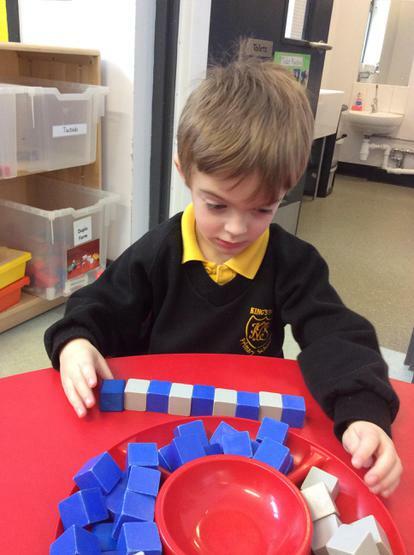 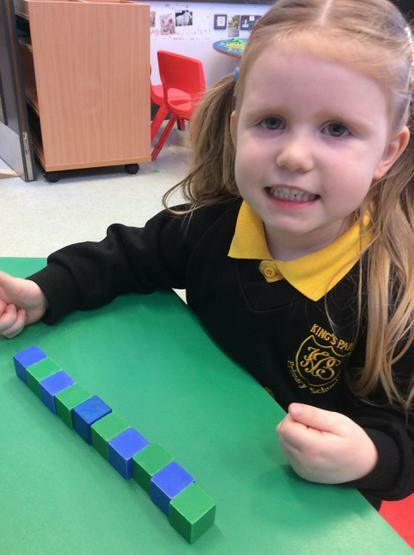 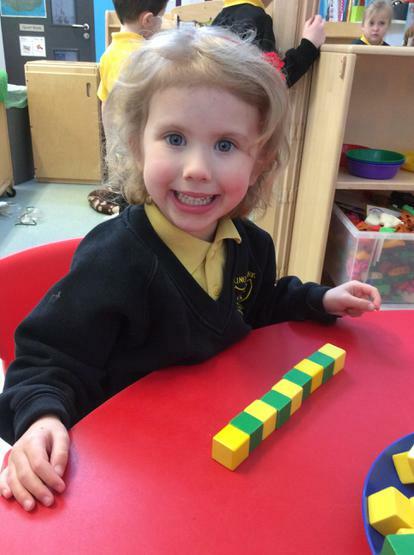 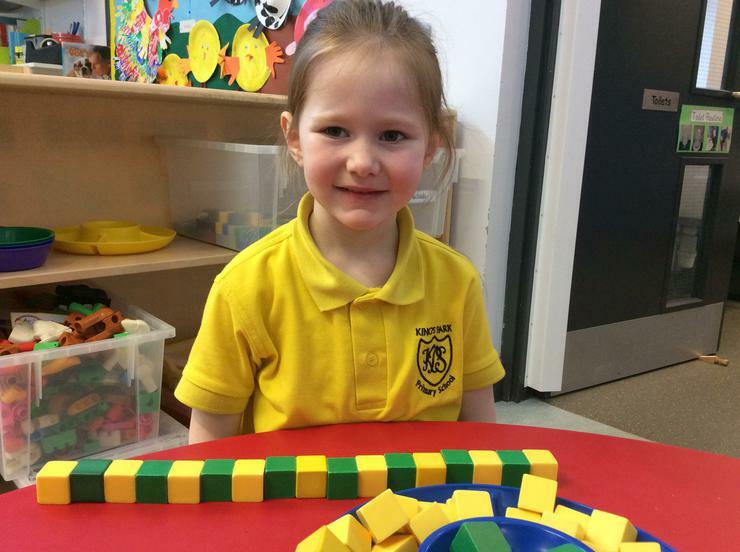 We have been busy creating 2 colour patterns! 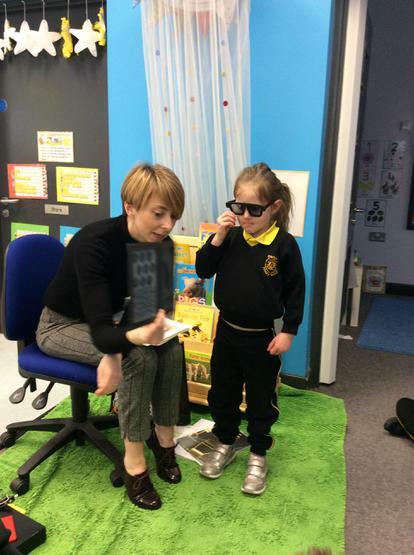 We had a visit from Dawn, the optician! 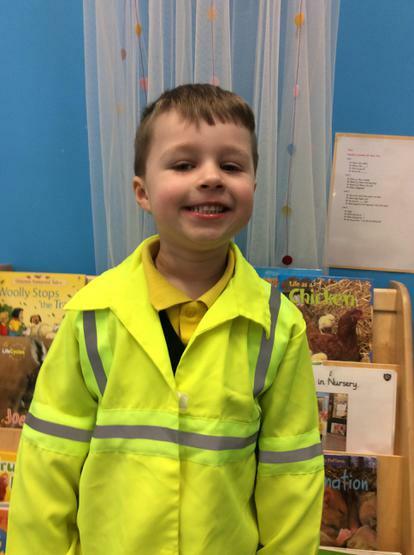 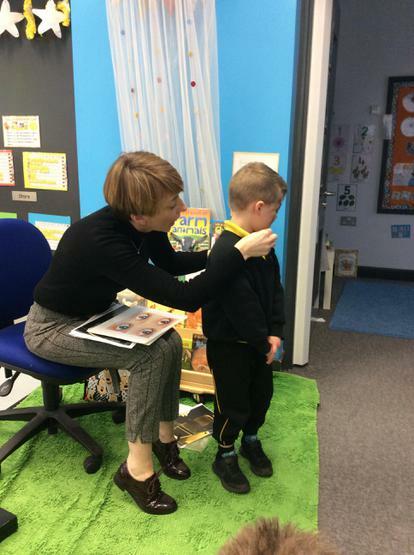 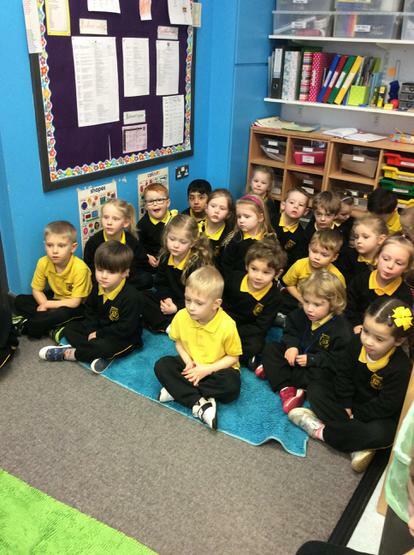 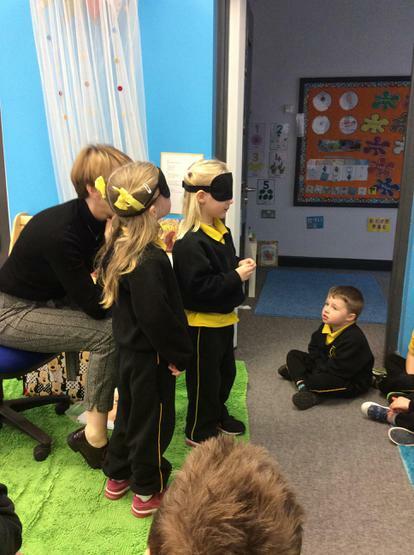 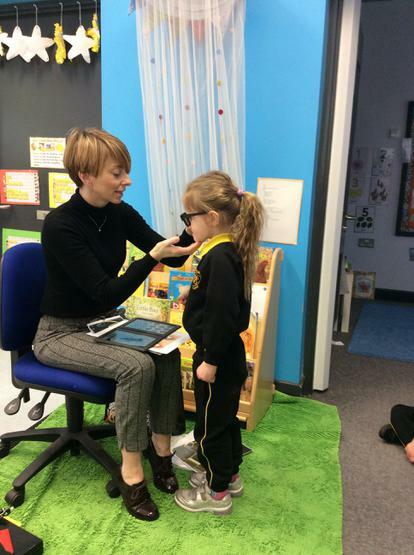 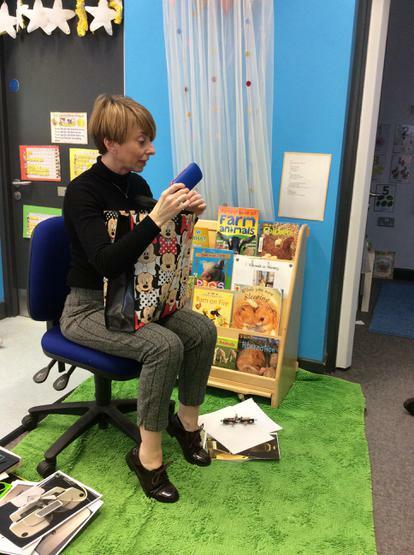 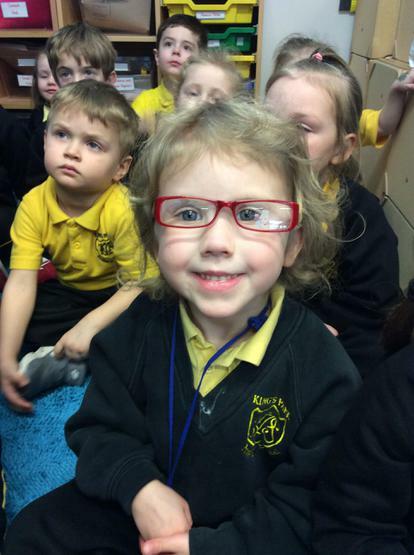 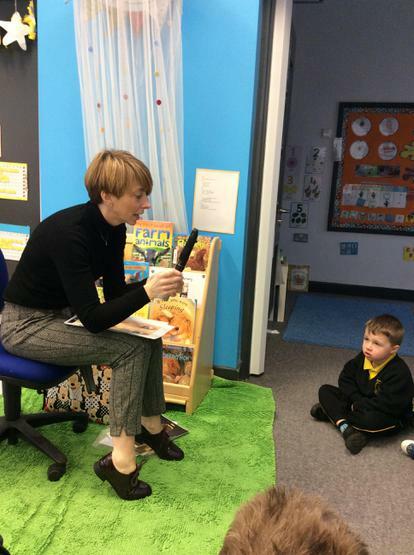 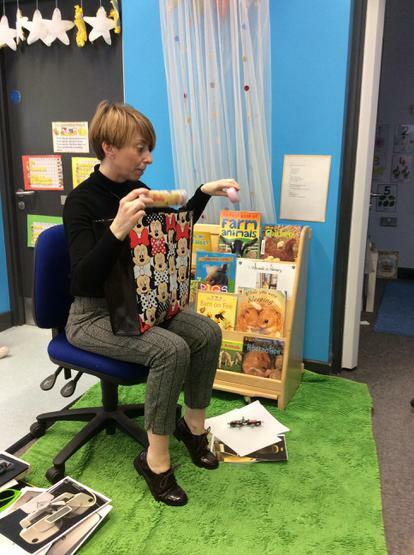 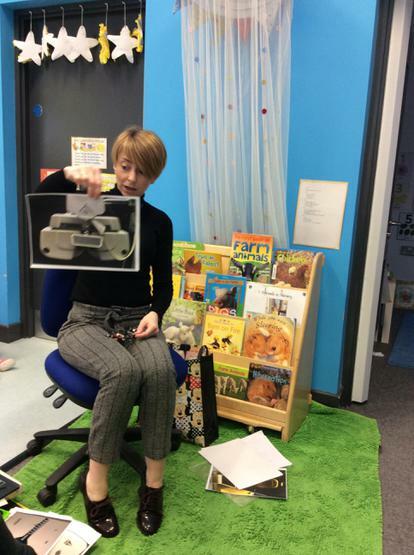 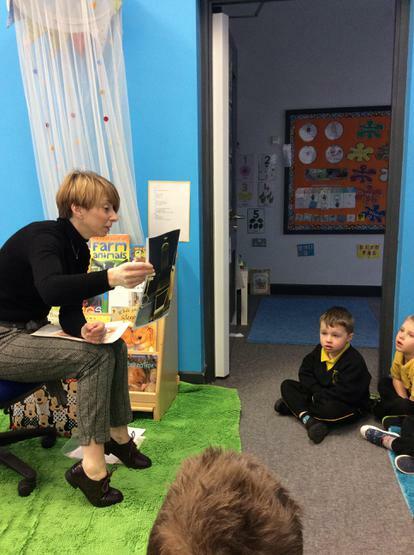 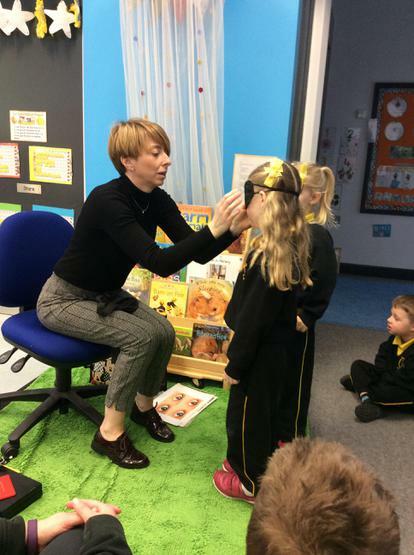 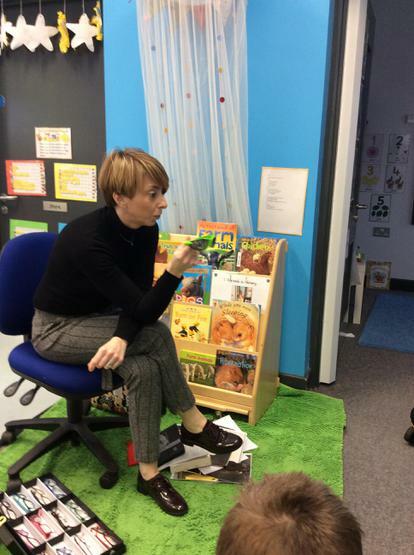 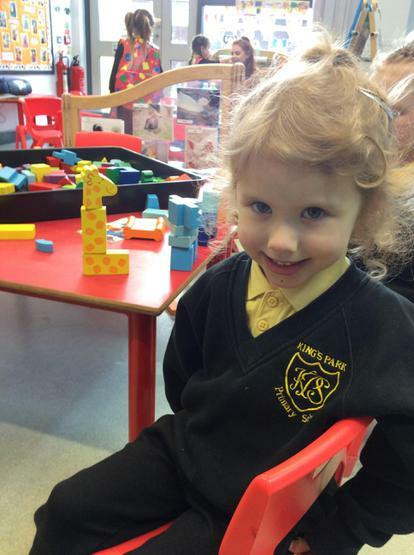 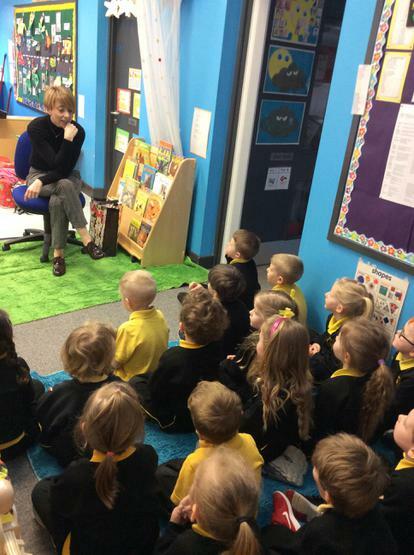 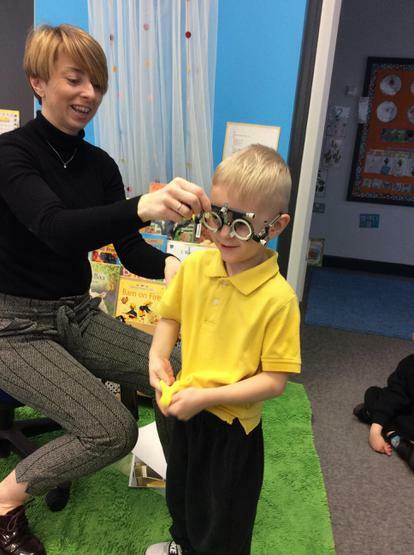 George’s mummy, Dawn, came in to Nursery to talk to us about her job as an optician. 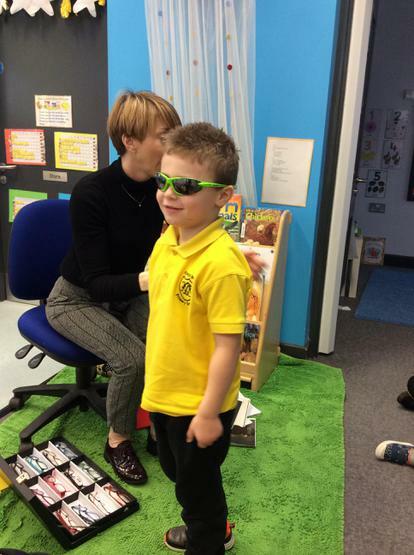 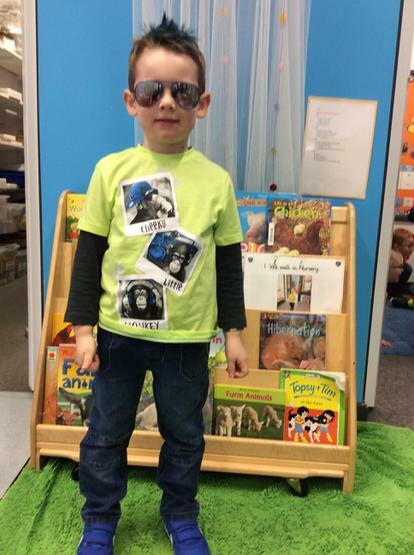 We even got to try on some very cool glasses! 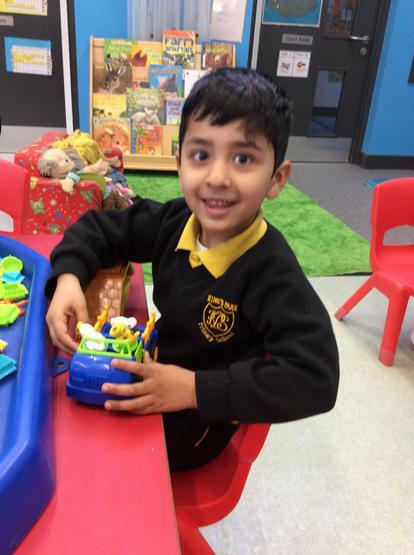 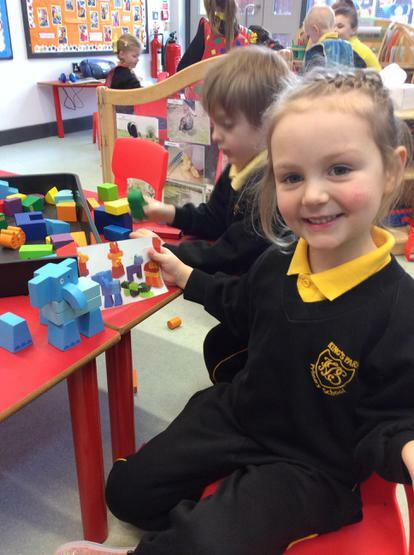 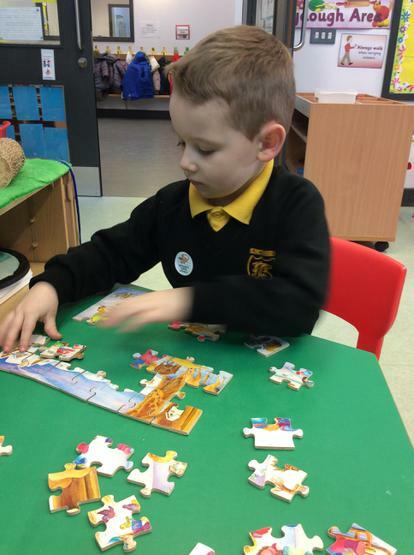 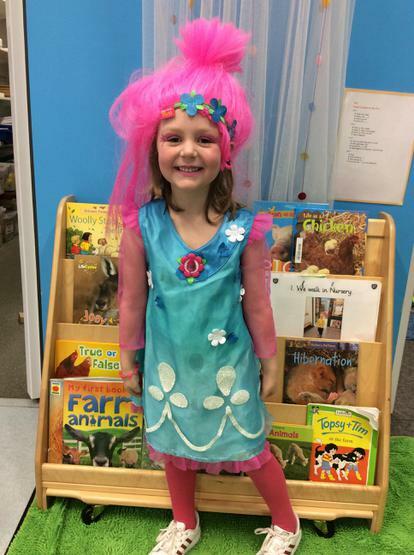 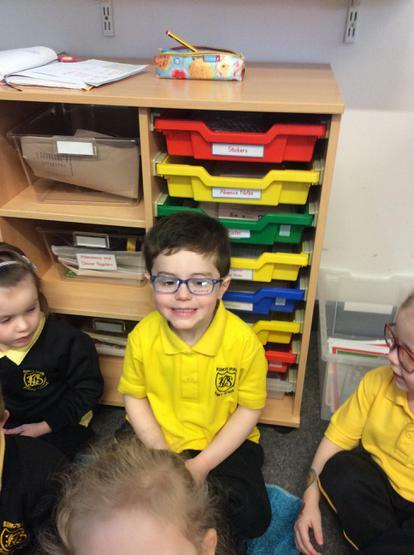 We are learning through our play! 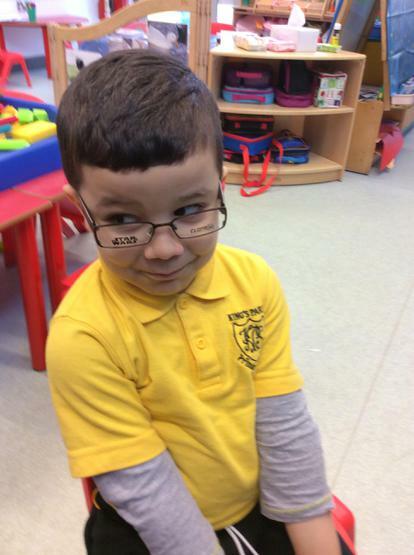 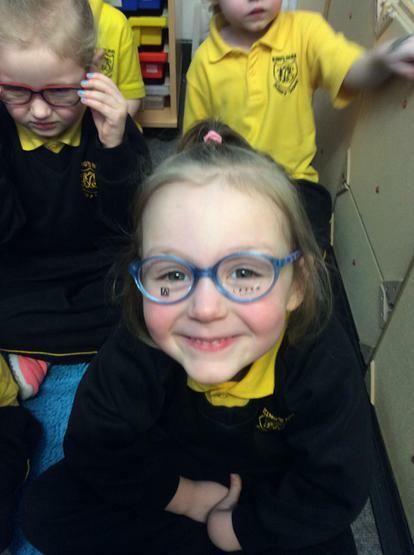 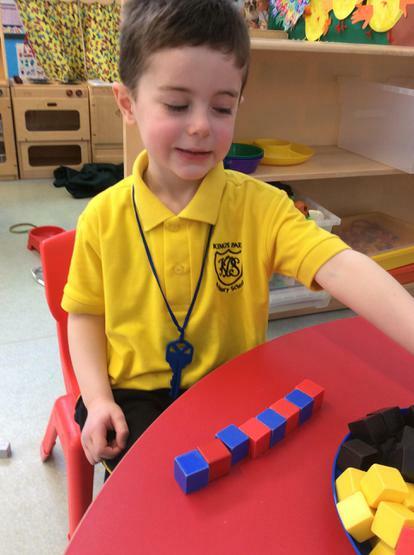 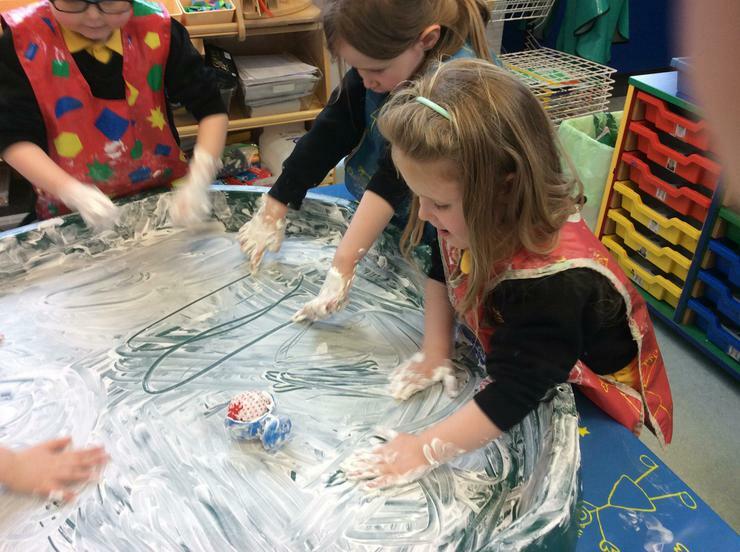 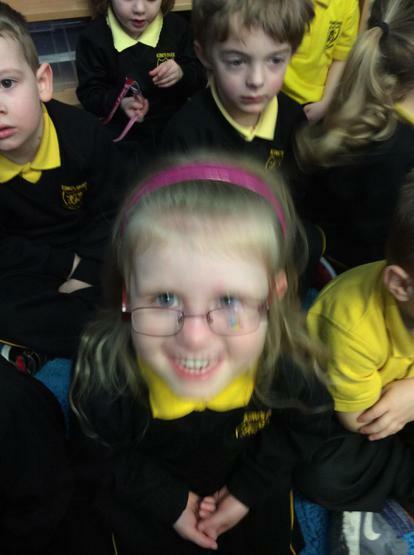 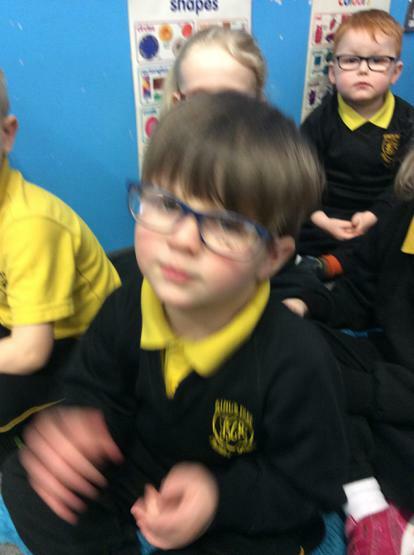 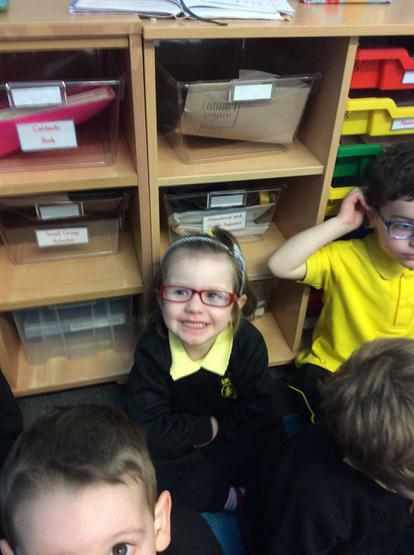 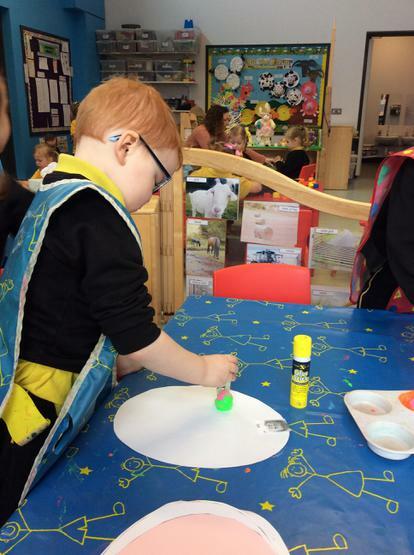 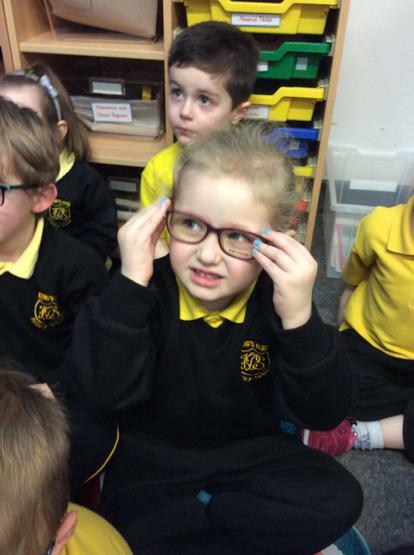 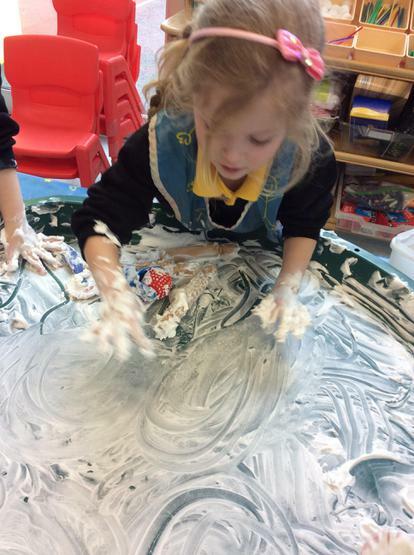 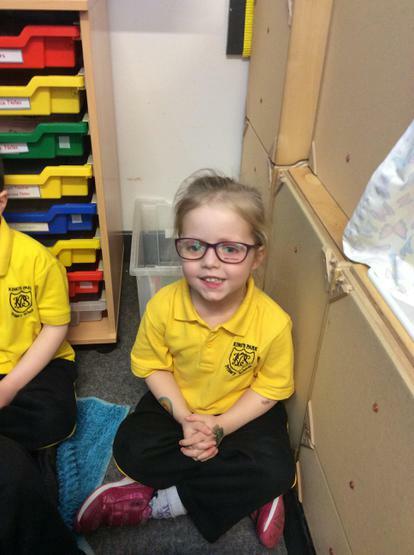 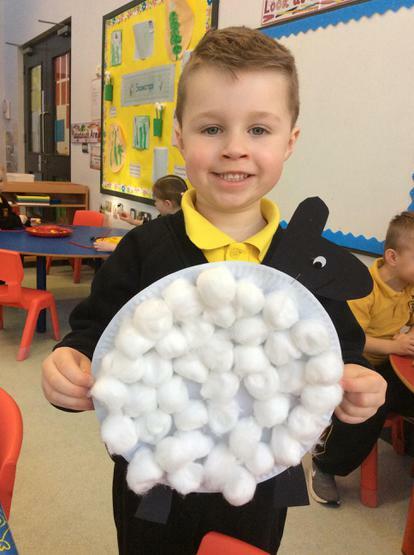 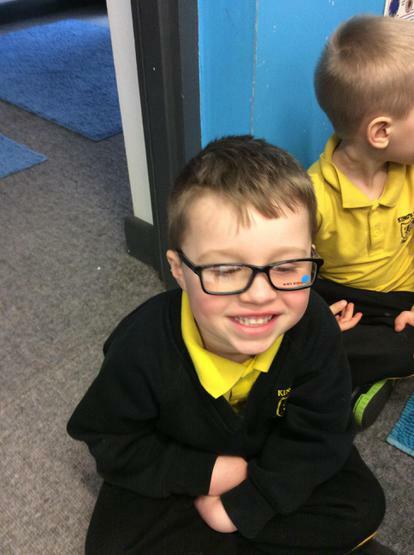 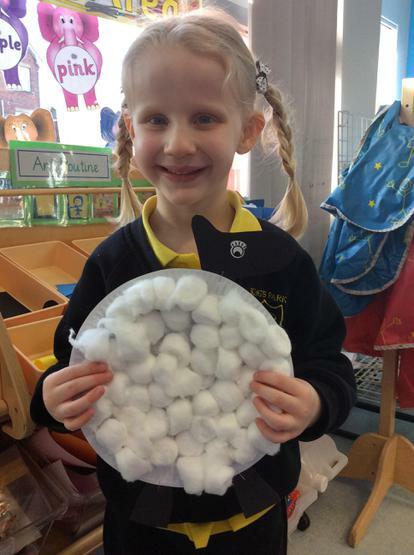 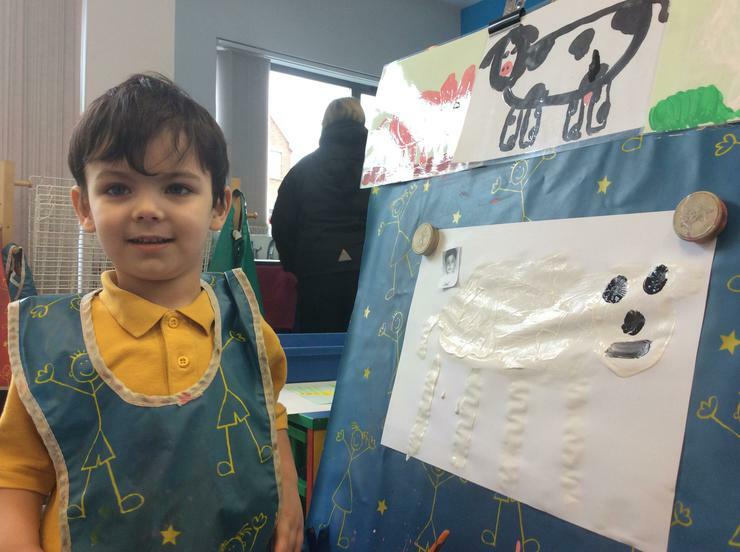 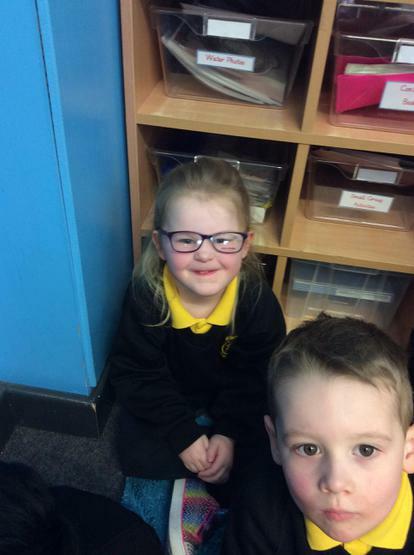 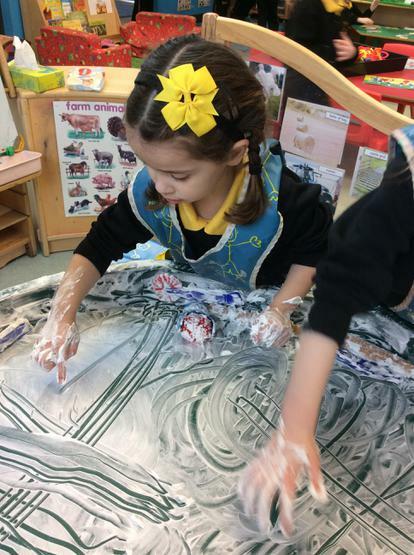 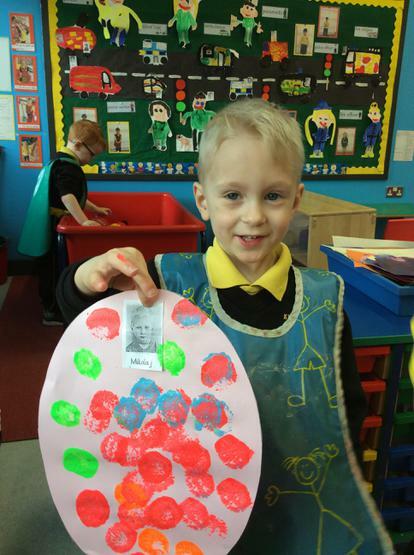 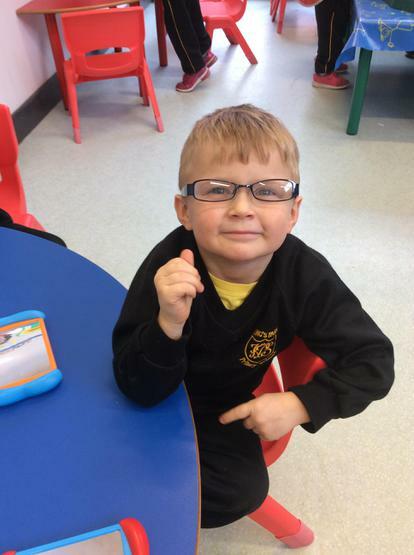 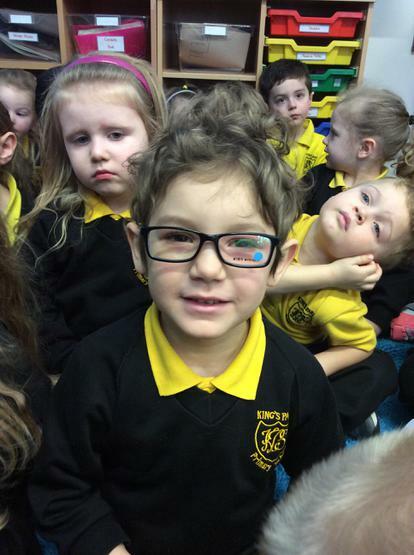 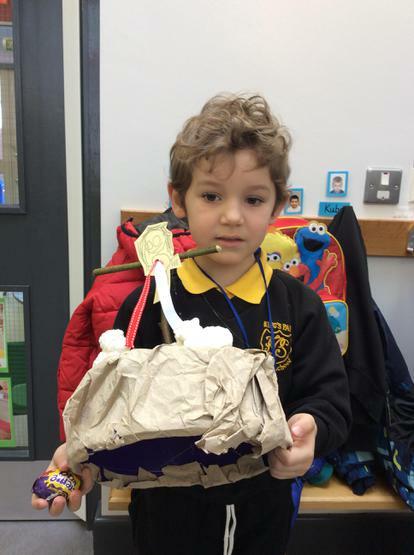 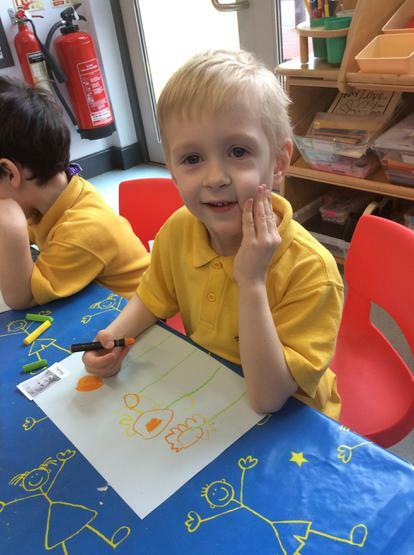 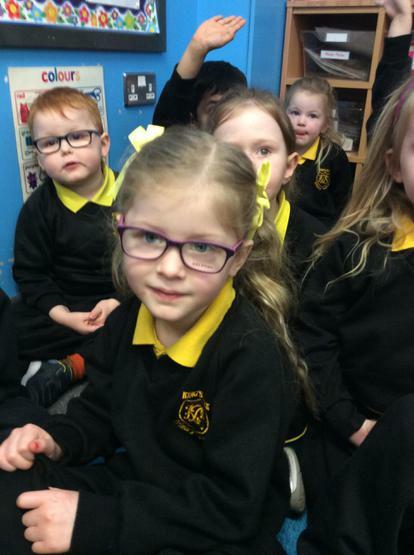 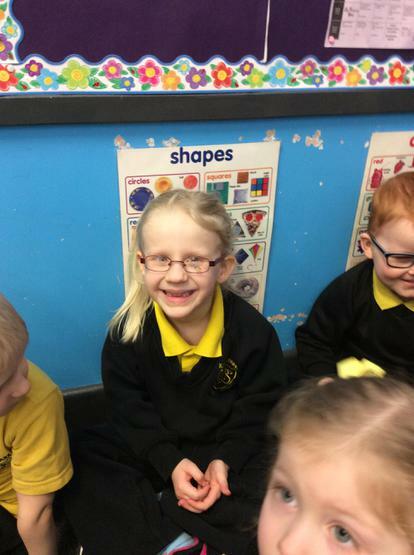 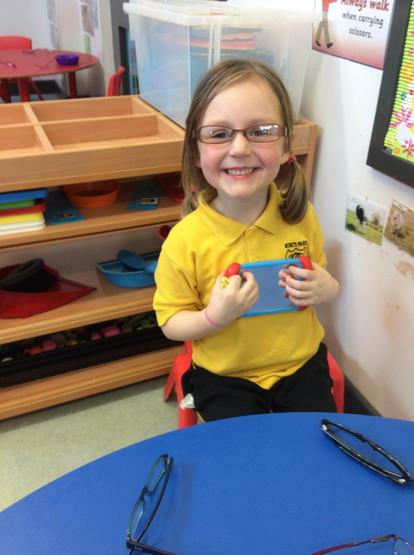 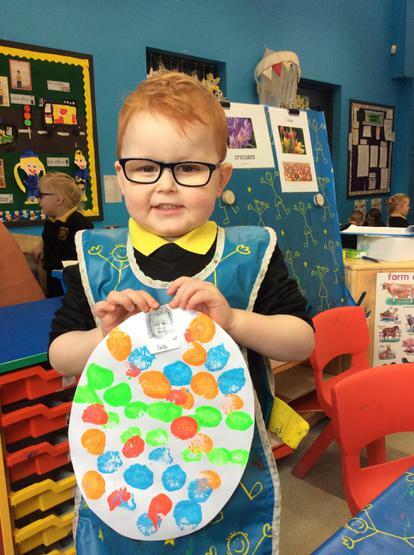 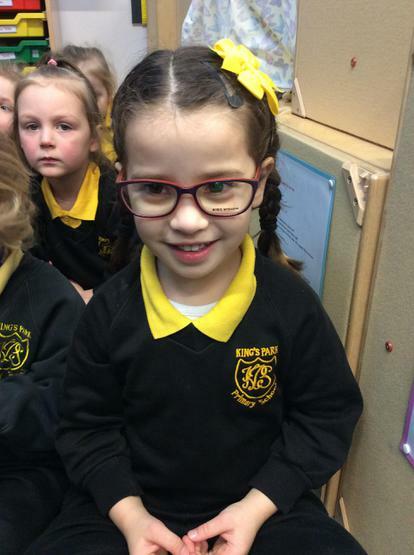 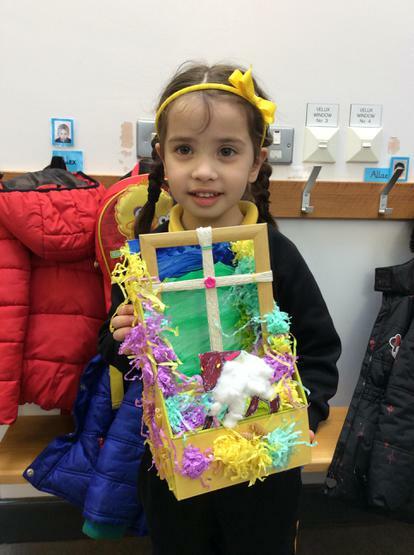 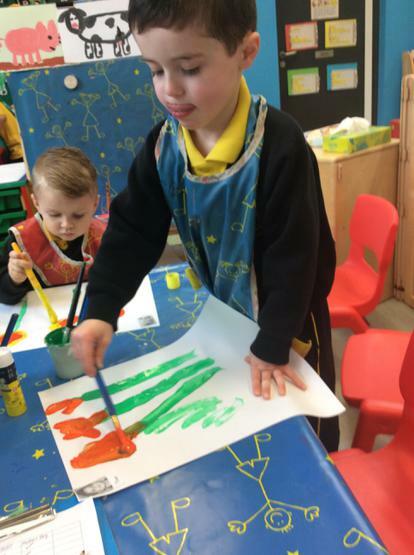 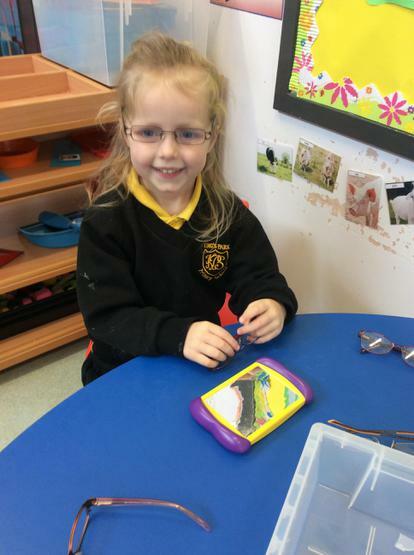 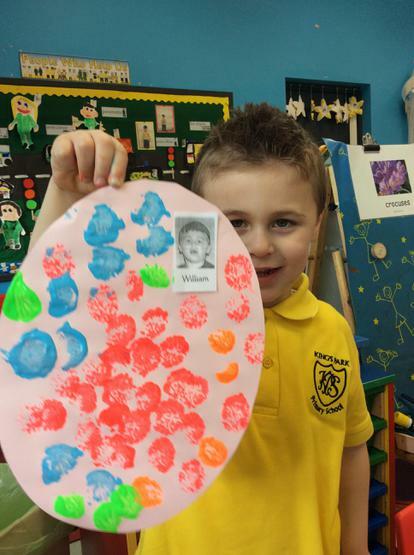 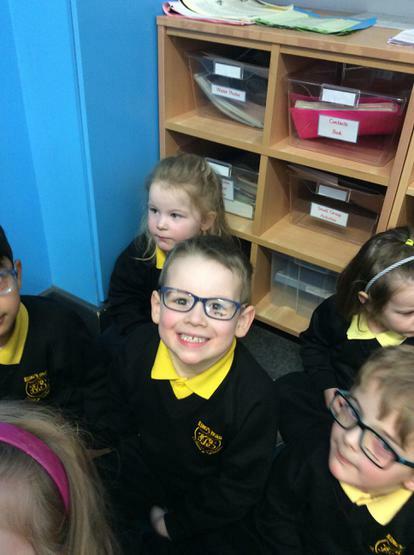 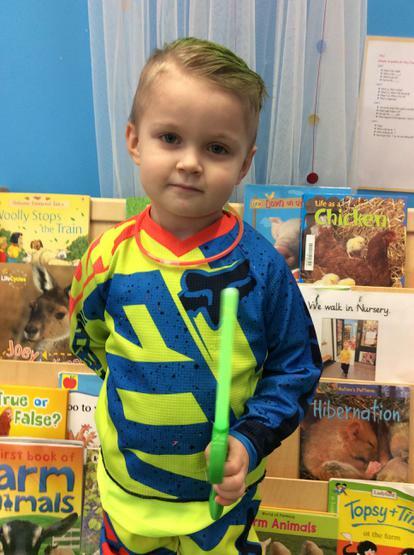 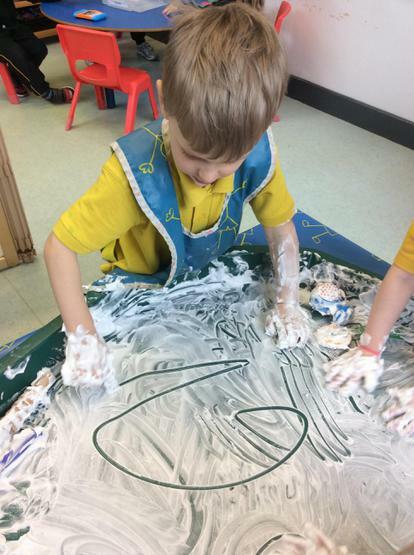 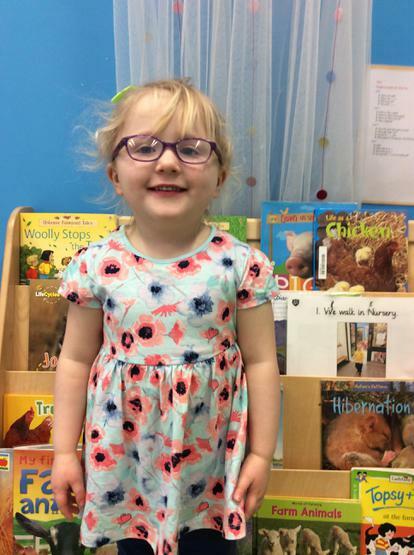 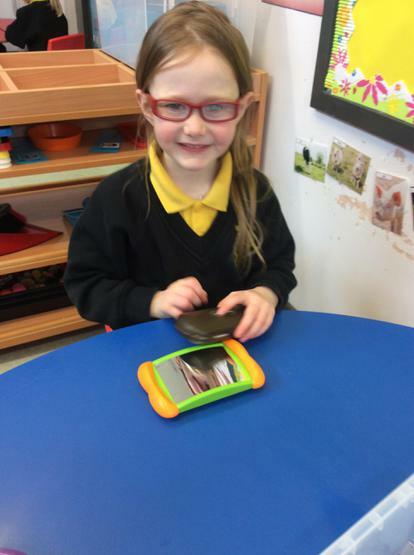 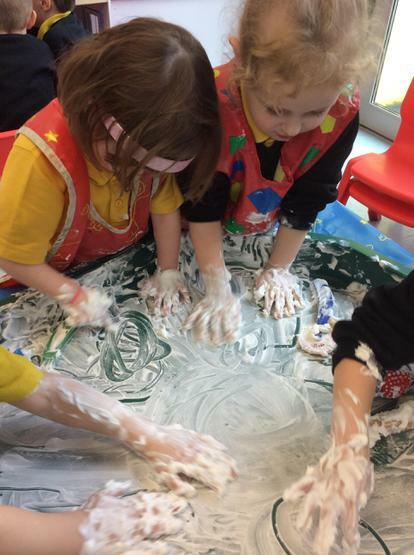 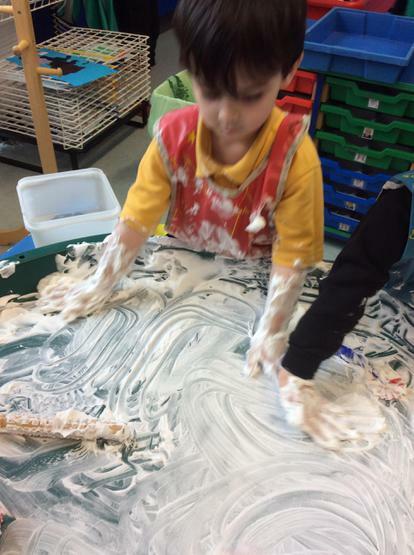 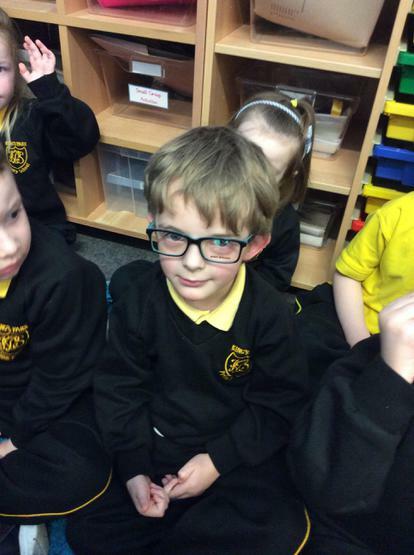 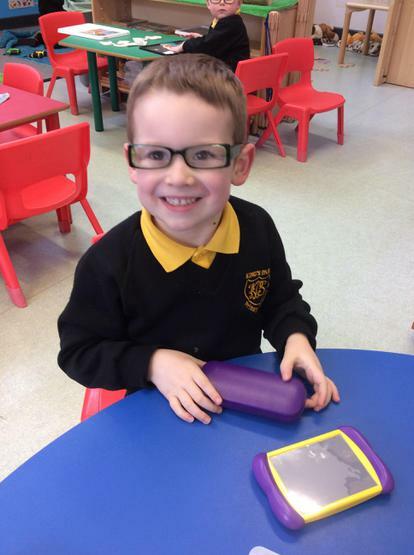 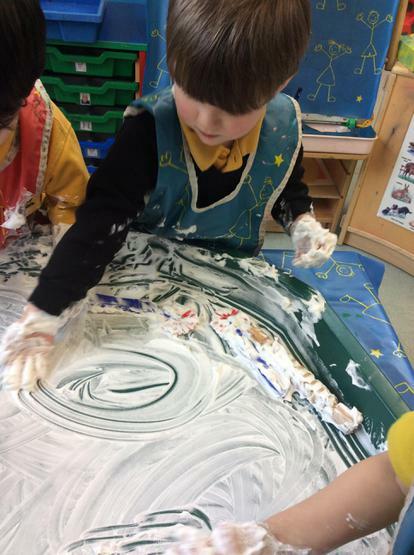 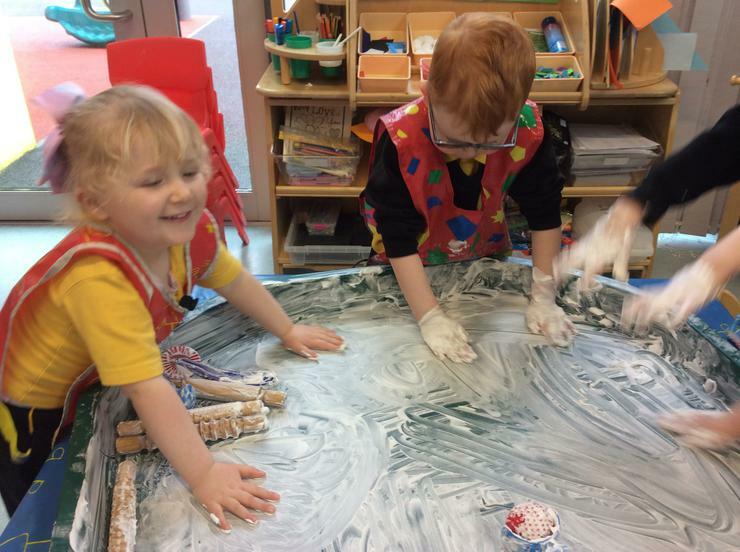 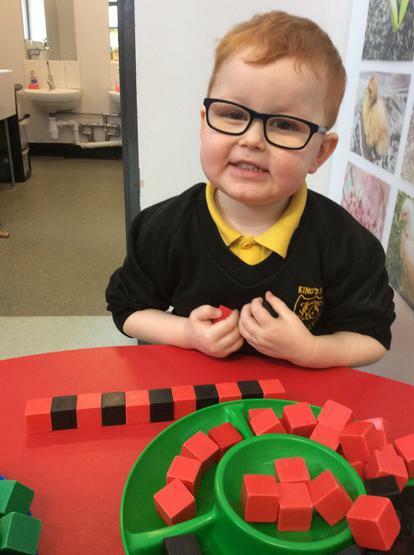 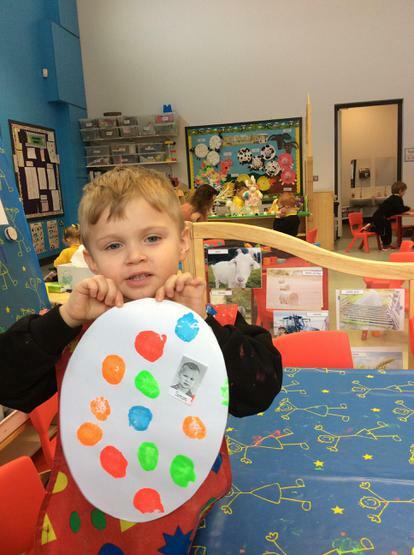 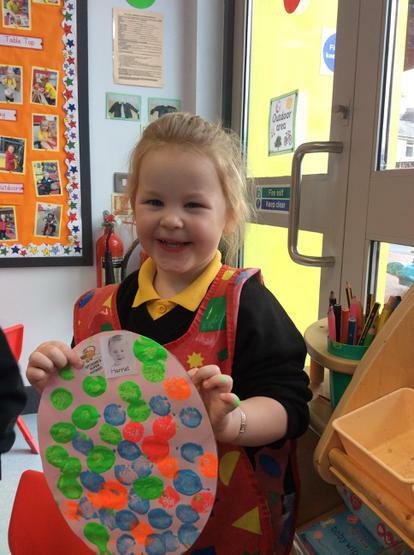 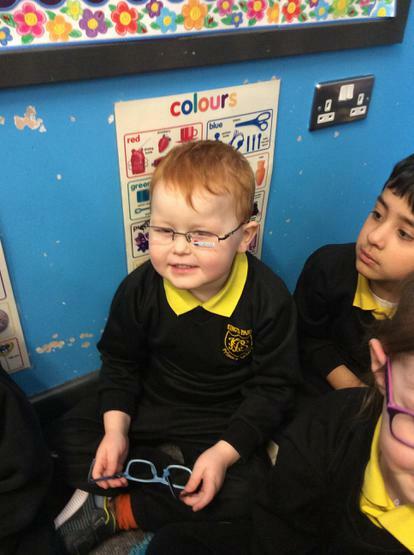 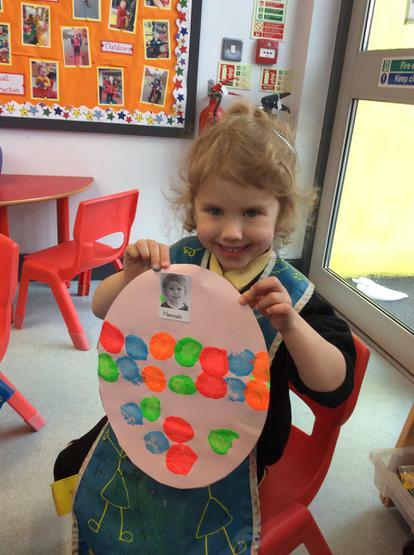 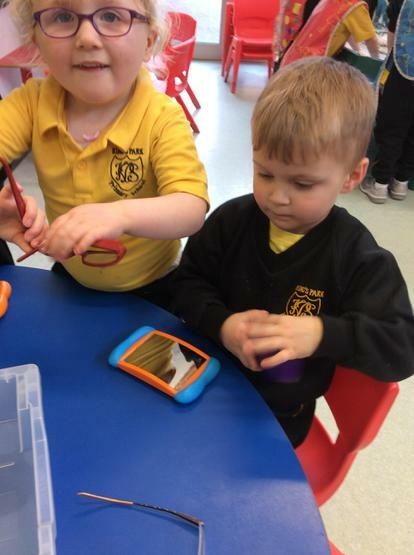 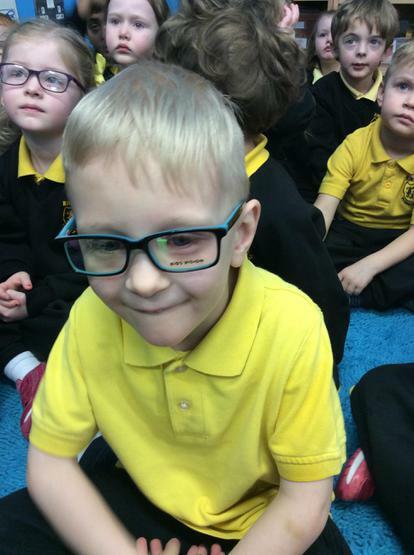 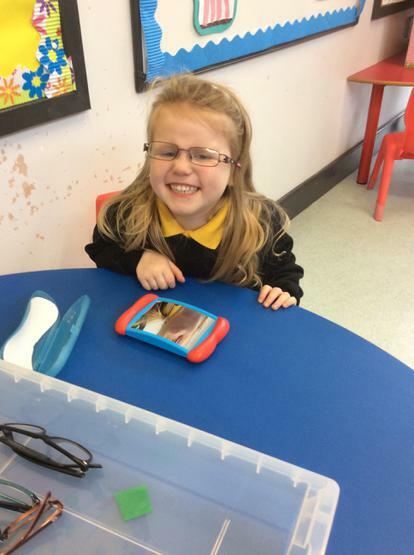 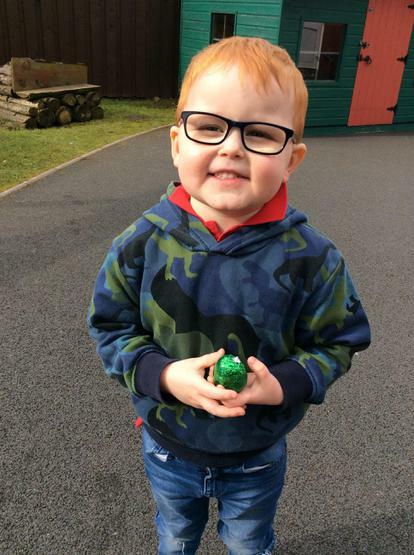 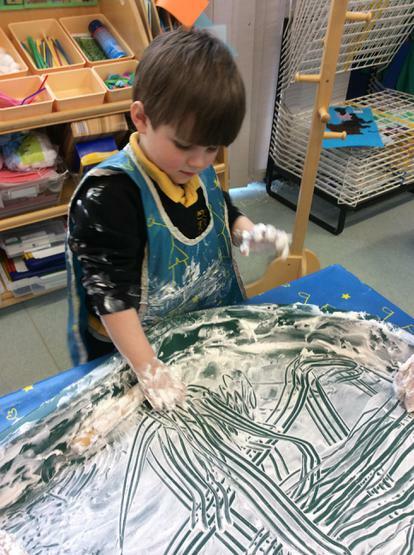 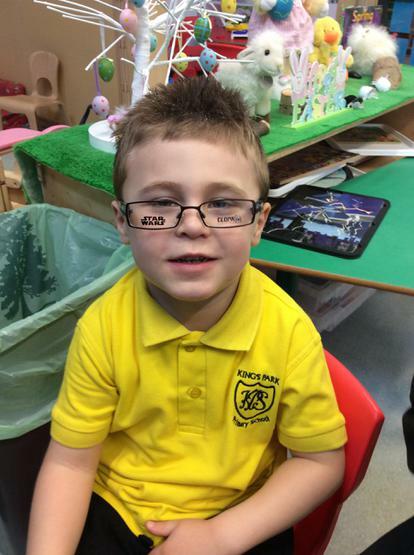 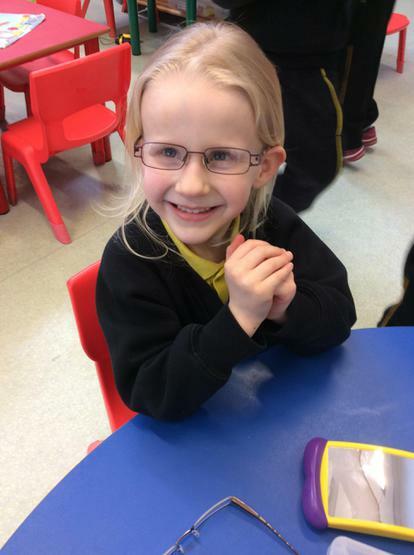 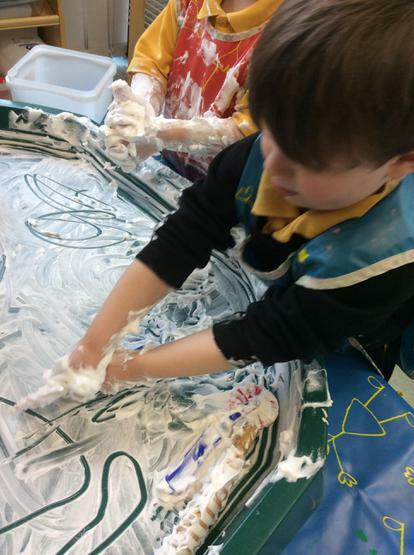 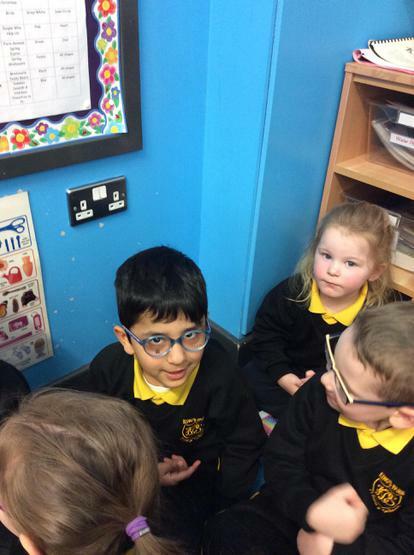 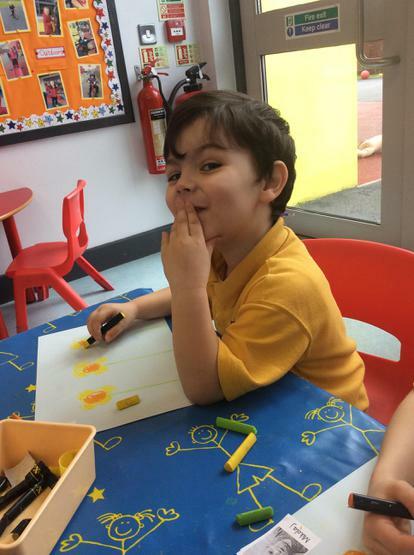 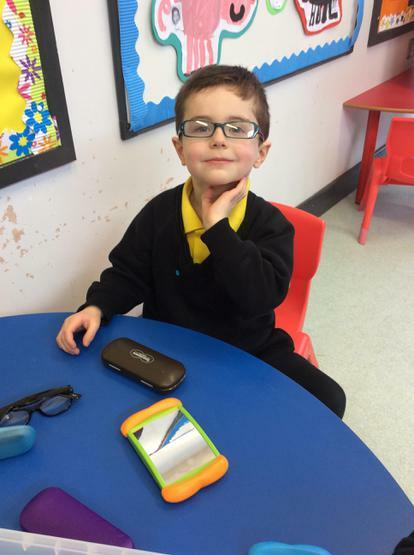 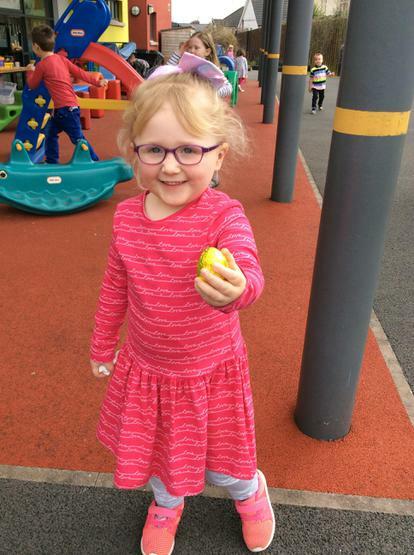 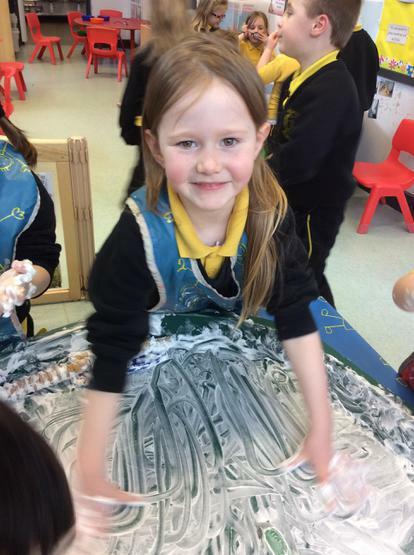 We have enjoyed sensory play with shaving foam, making Easter egg patterns using pegs, Pom poms and paint and looking in the mirror trying on glasses after our visit from the optician! 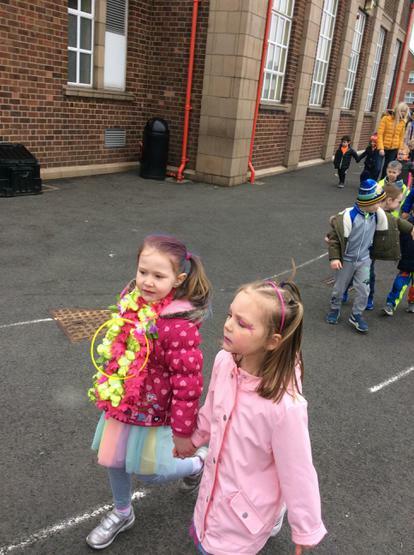 Glow for It Charity Day! 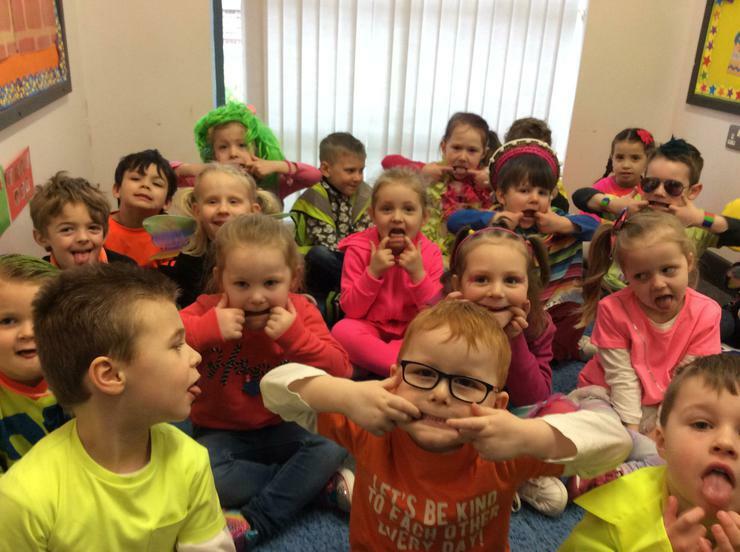 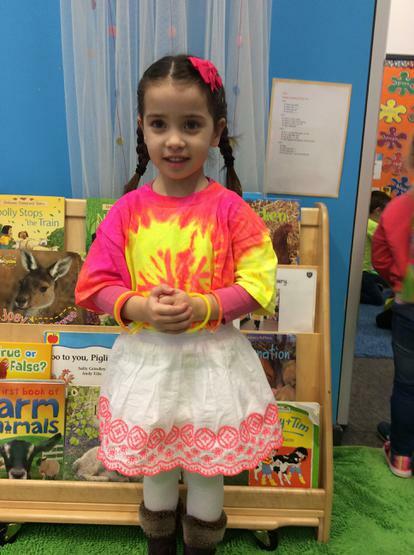 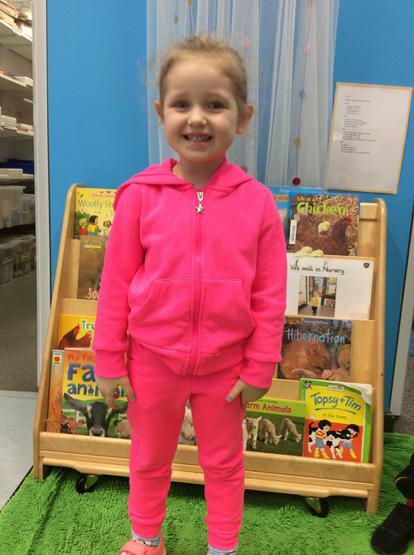 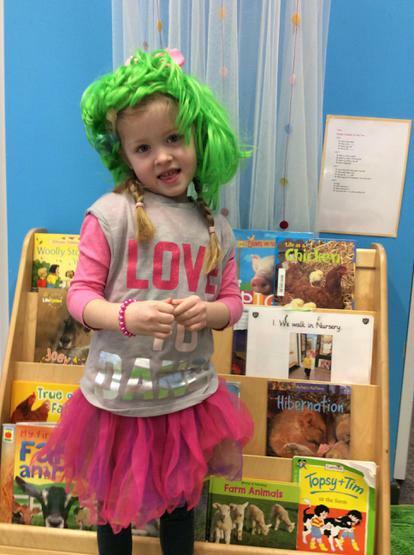 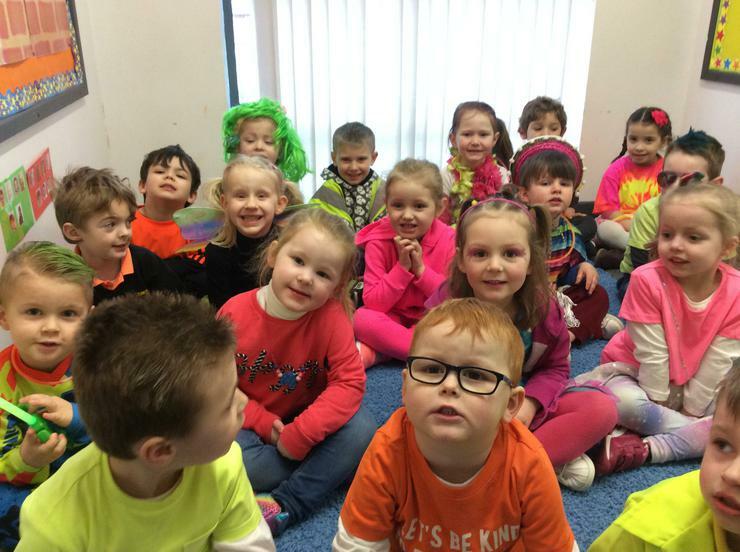 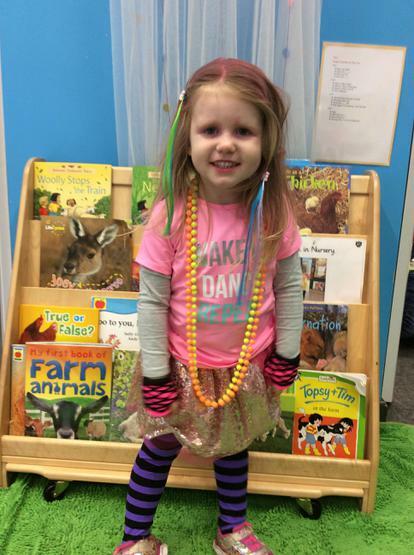 We all really enjoyed our Glow for It Charity Day! 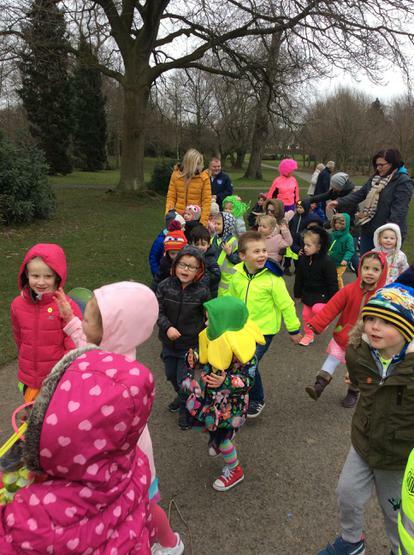 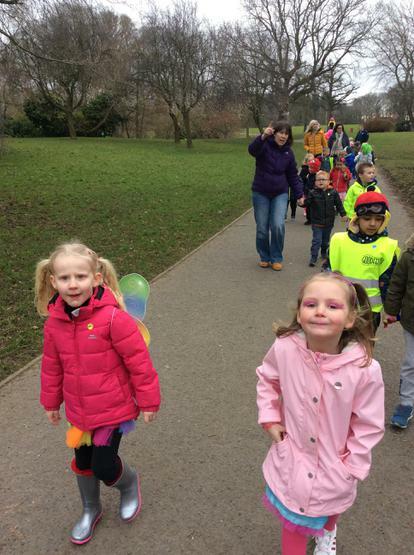 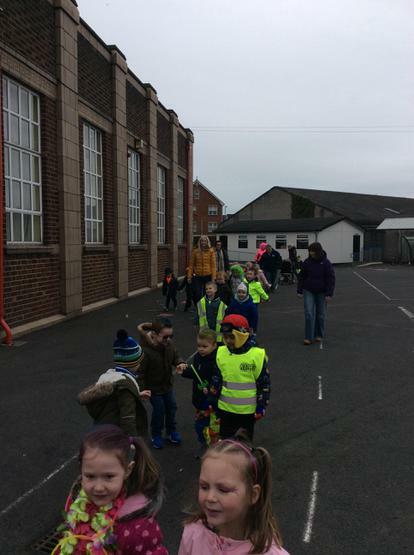 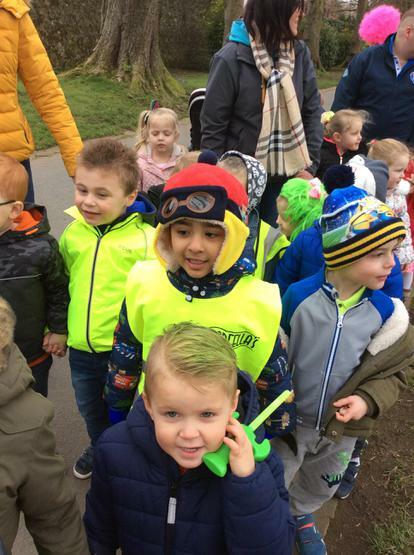 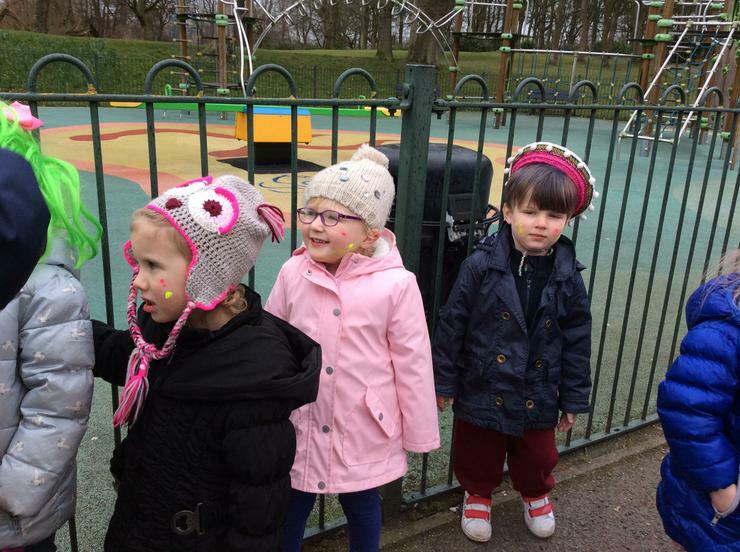 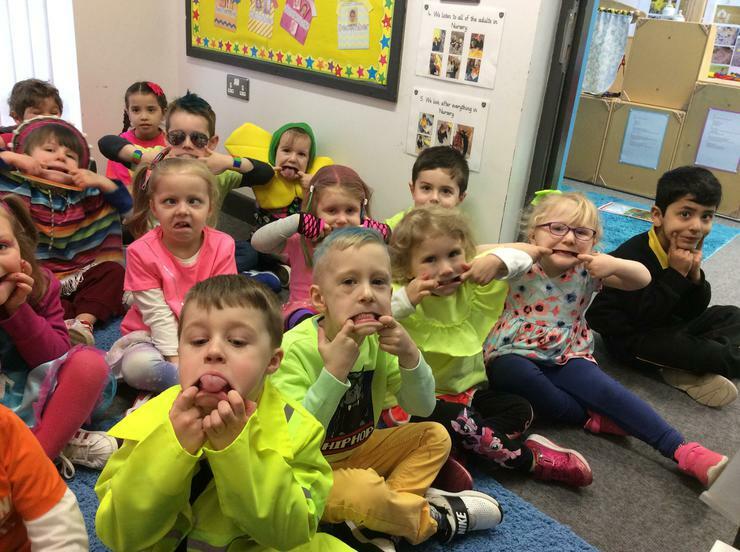 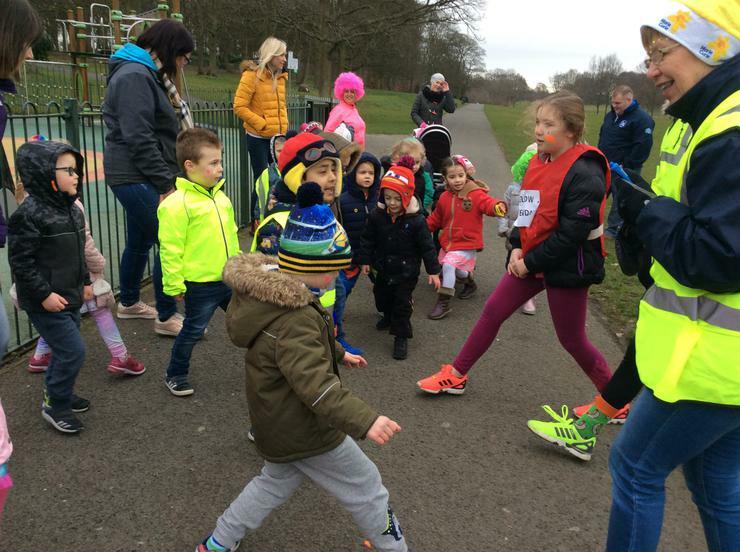 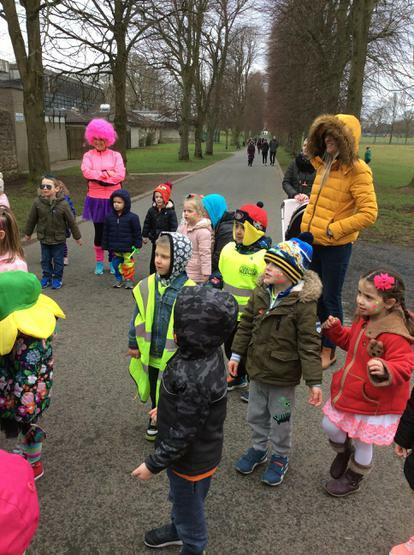 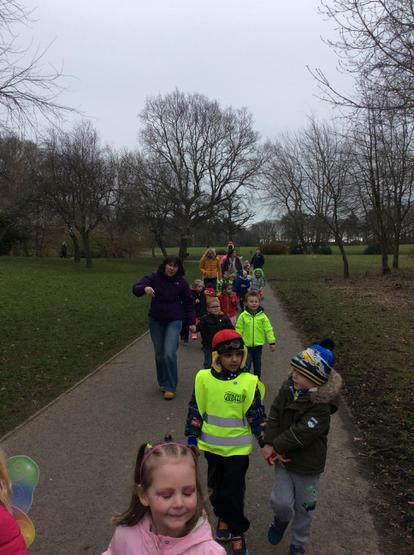 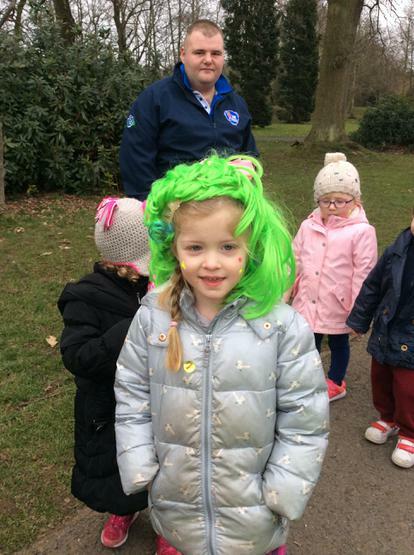 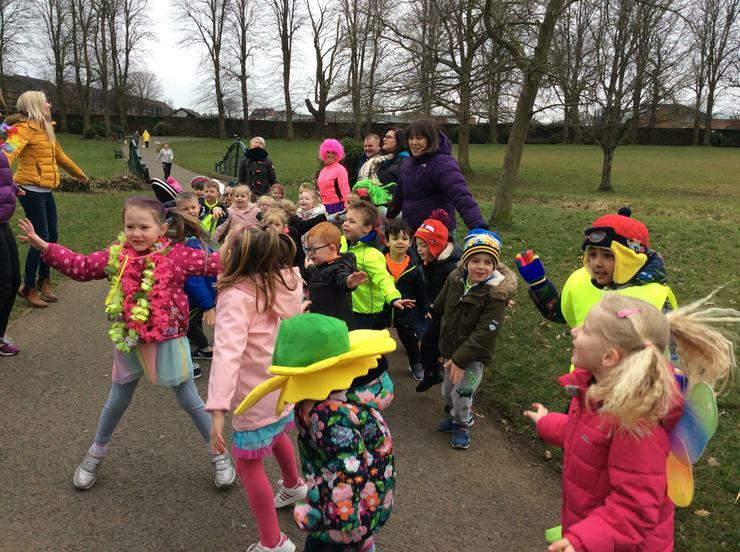 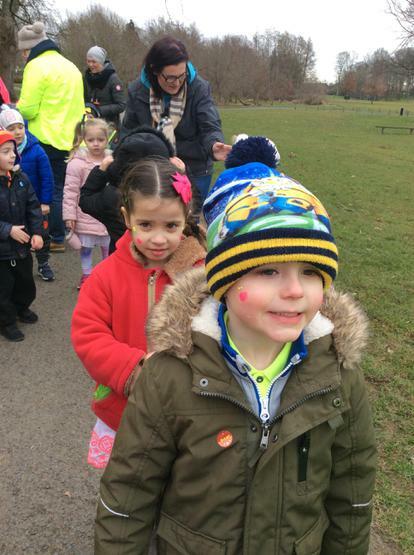 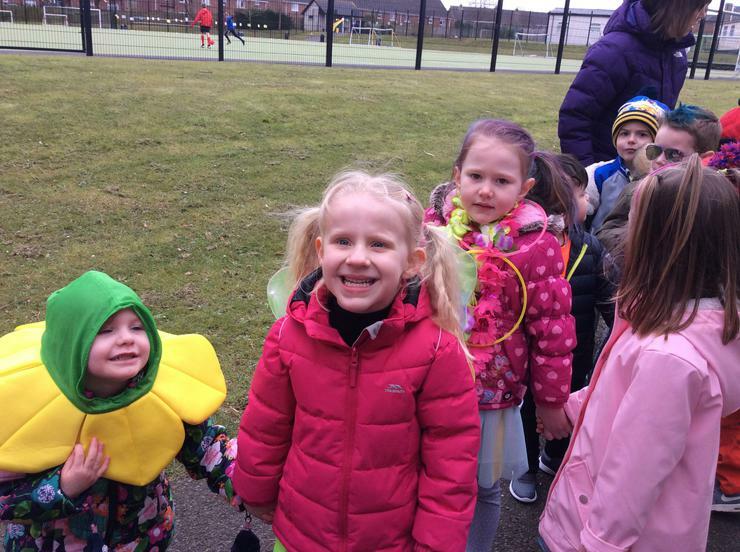 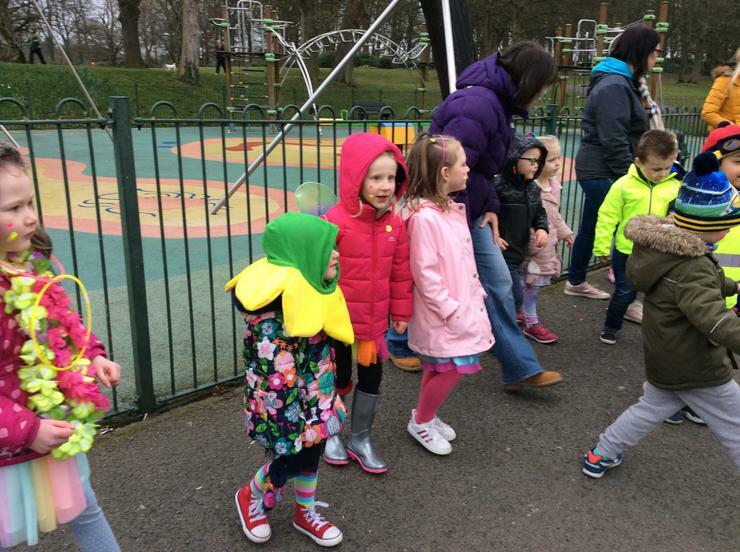 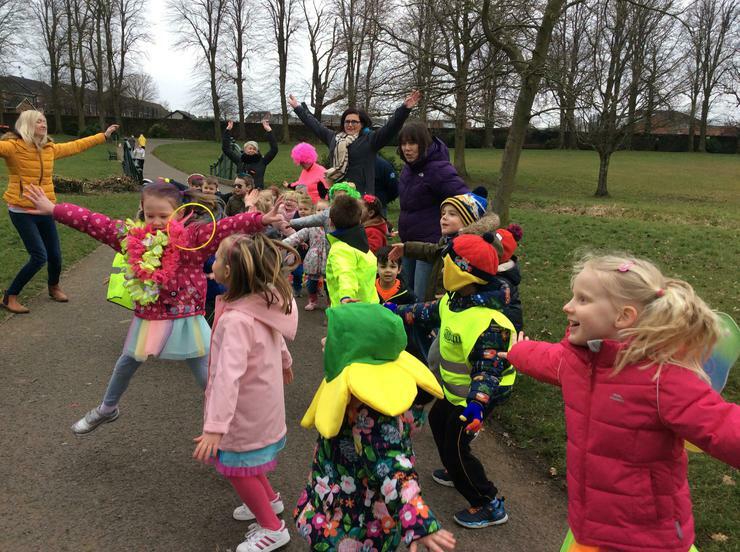 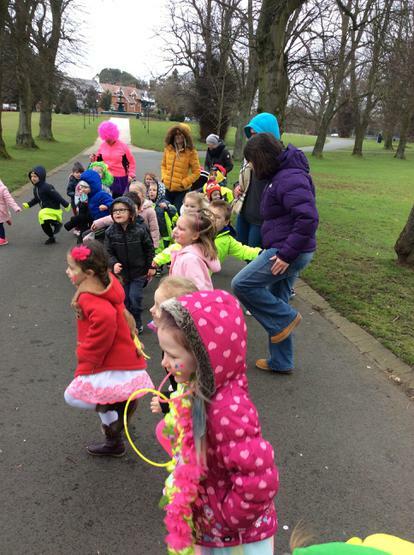 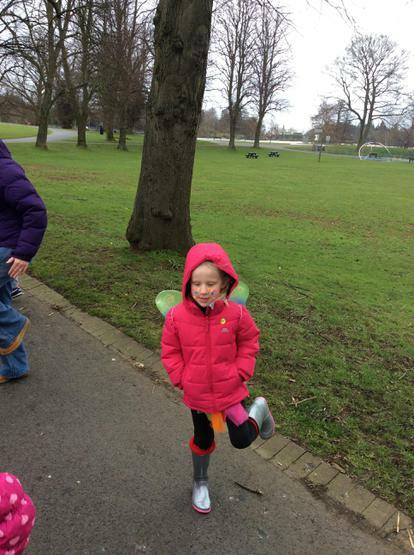 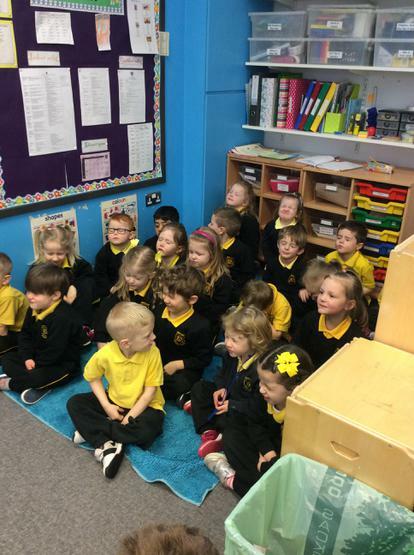 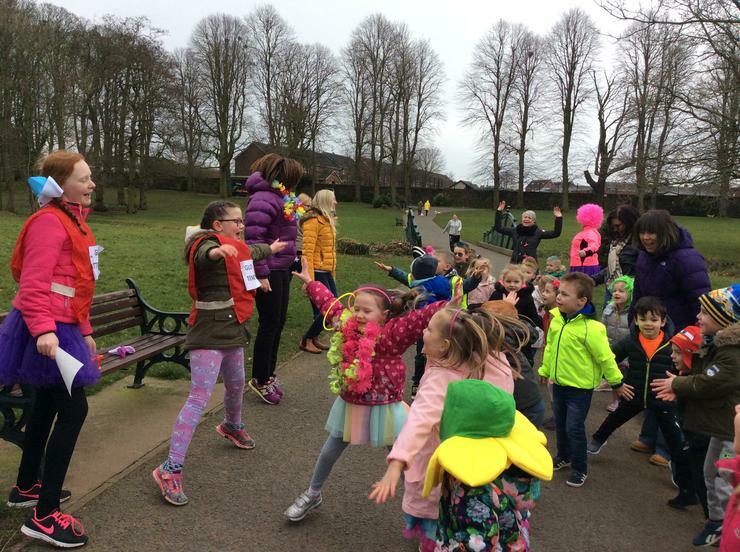 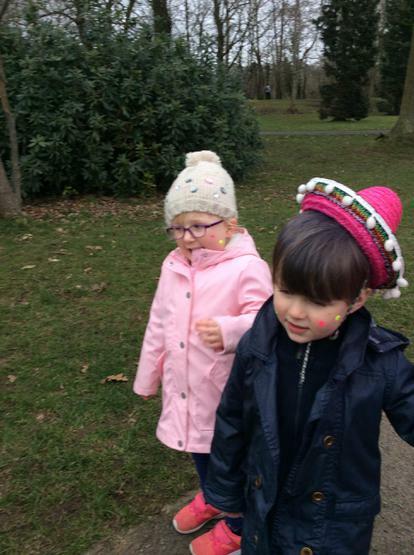 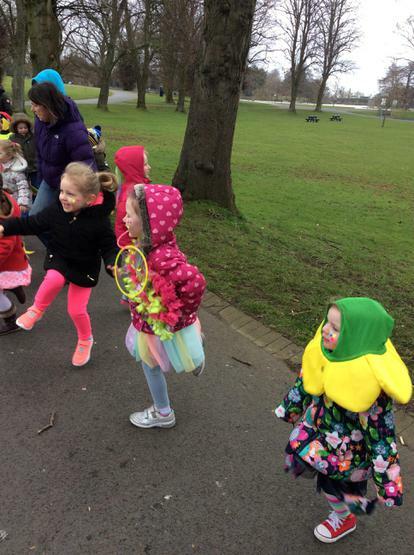 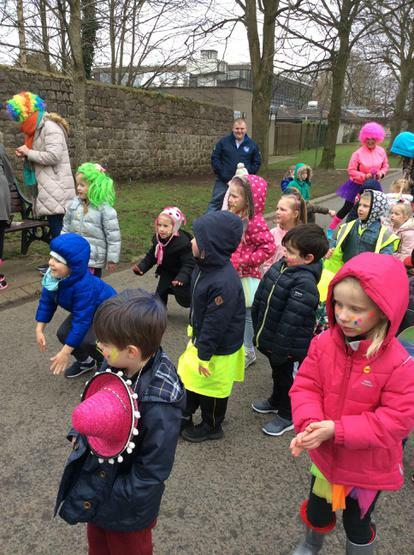 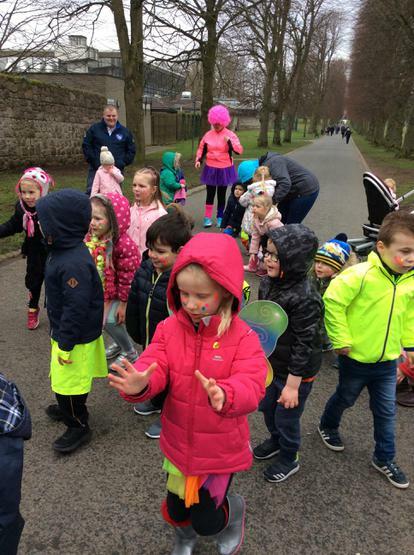 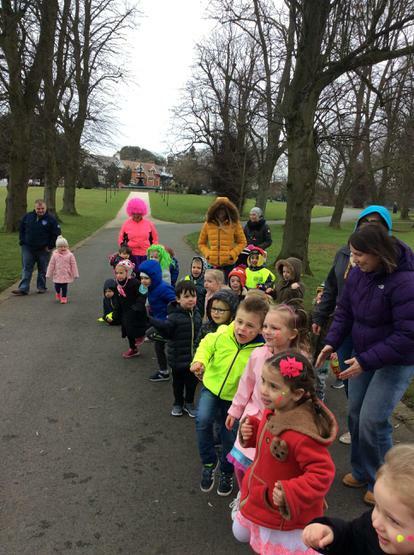 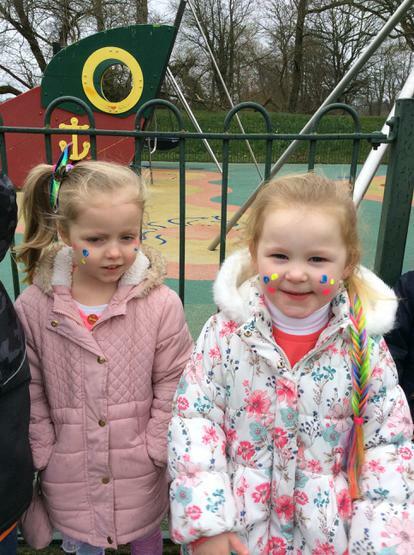 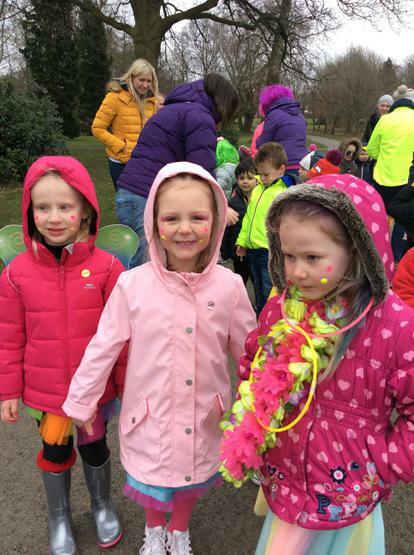 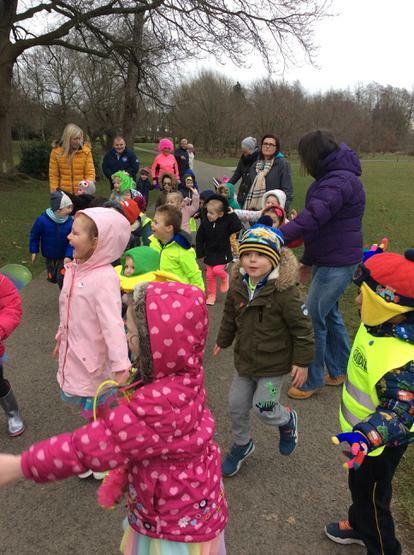 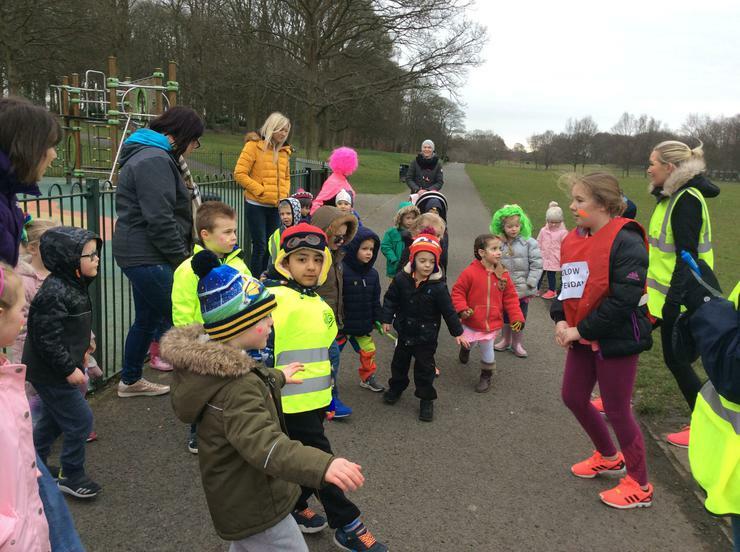 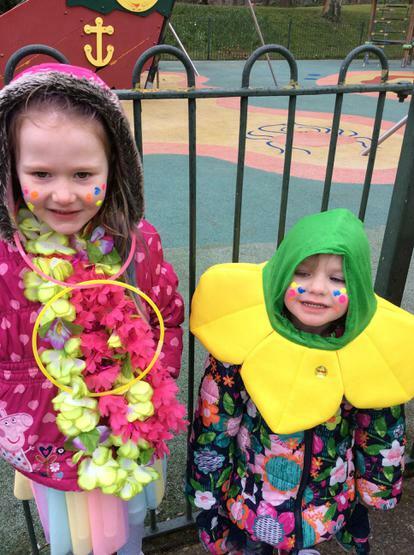 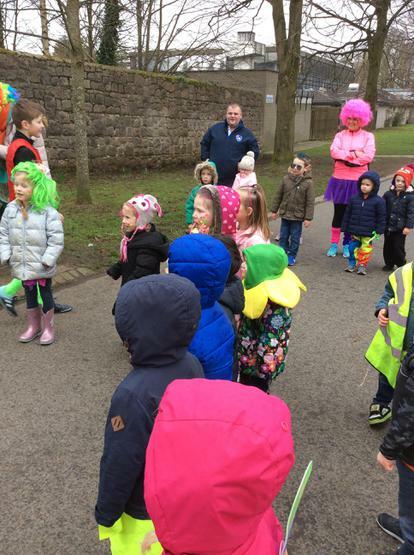 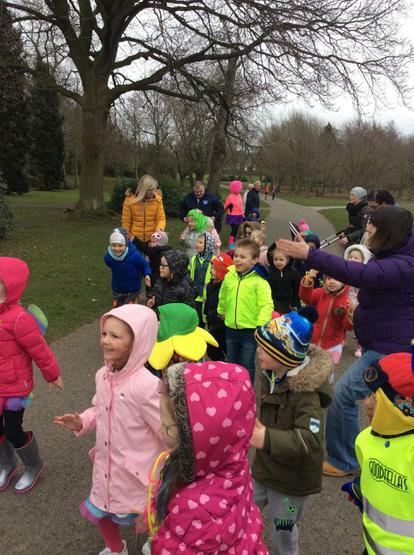 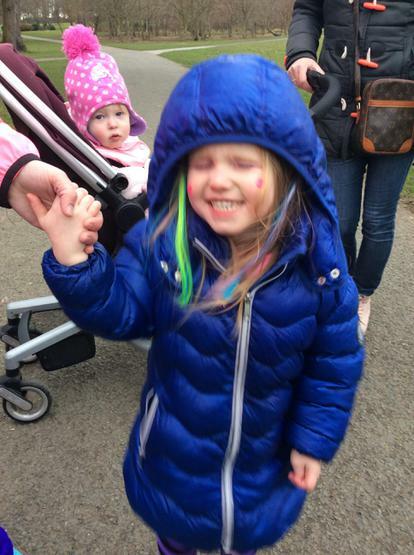 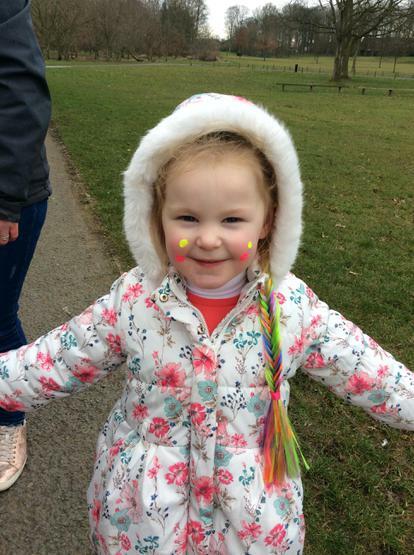 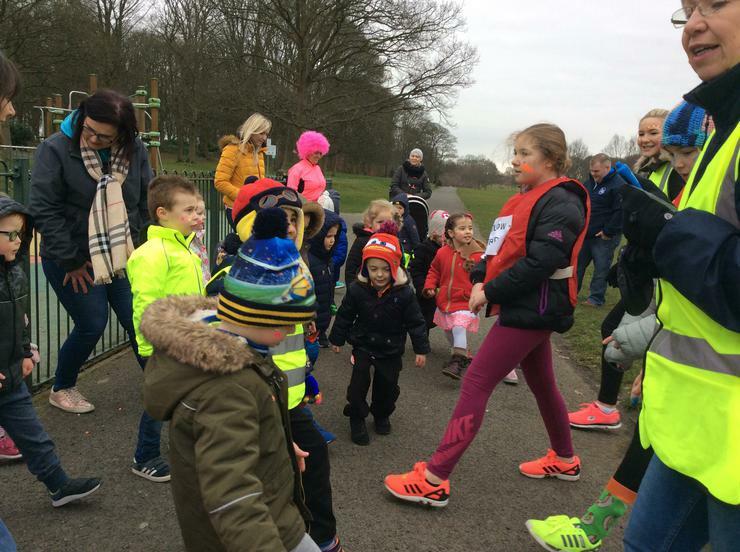 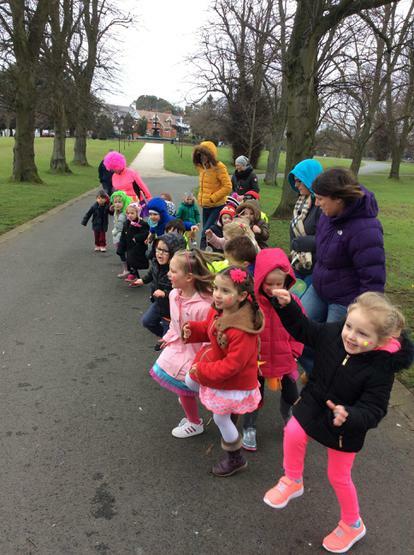 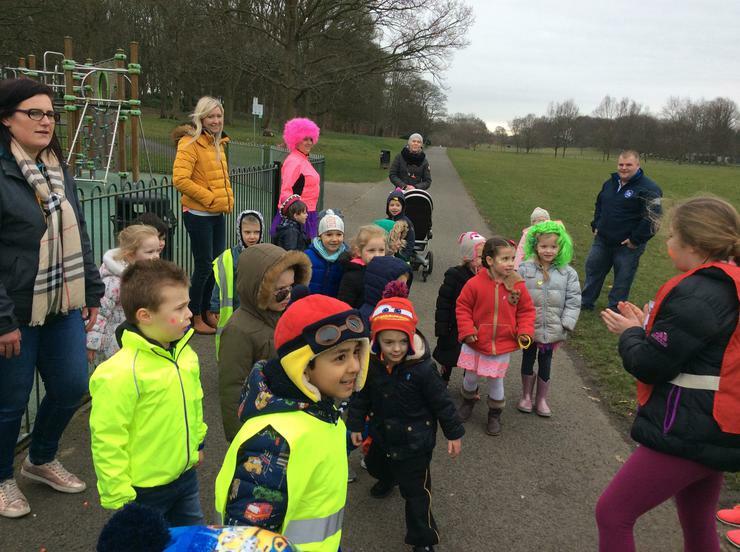 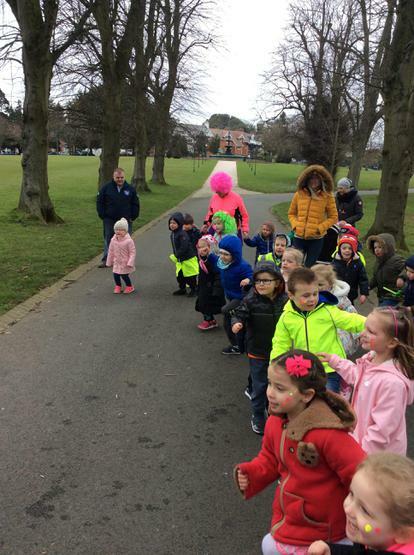 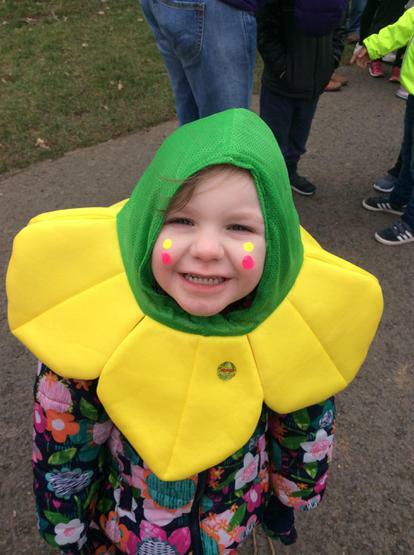 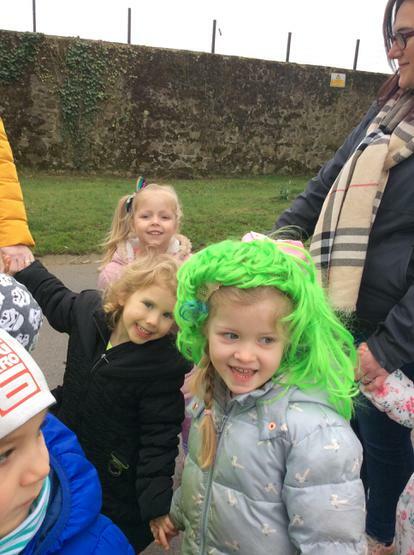 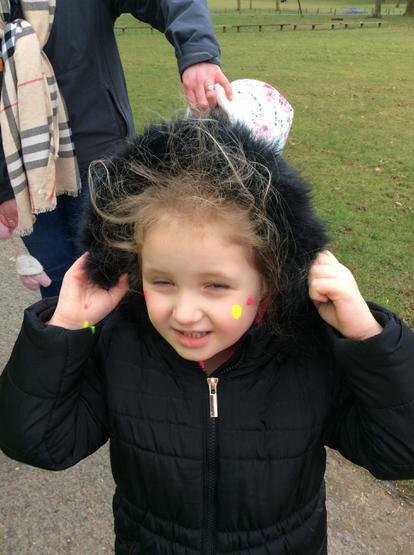 We had lots of fun dressing up in our brightly coloured clothes and taking part in the various challenges around Lurgan Park! 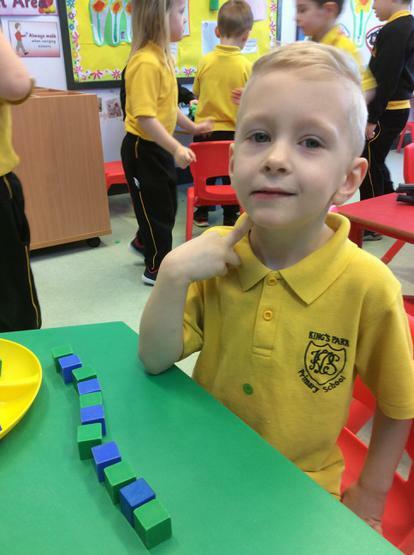 We hope that lots of money will be raised for all of the very important charities! 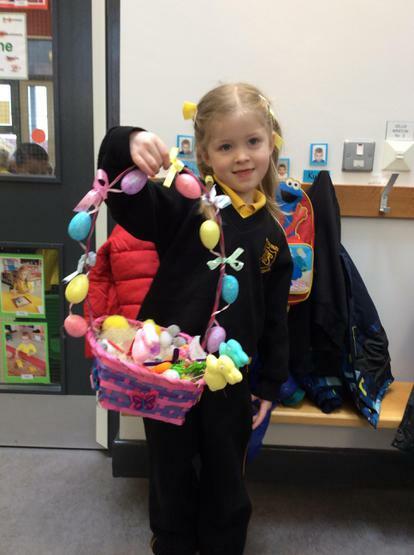 Well done to all of the boys and girls who entered the Easter competition! 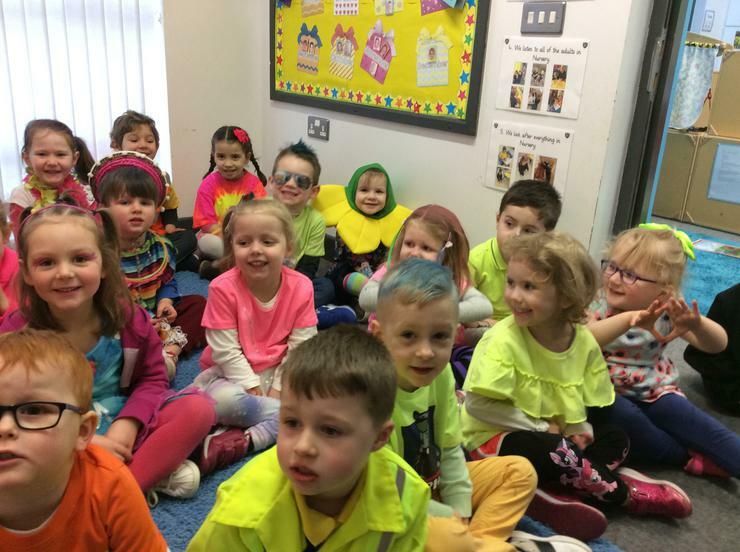 They all look beautiful! 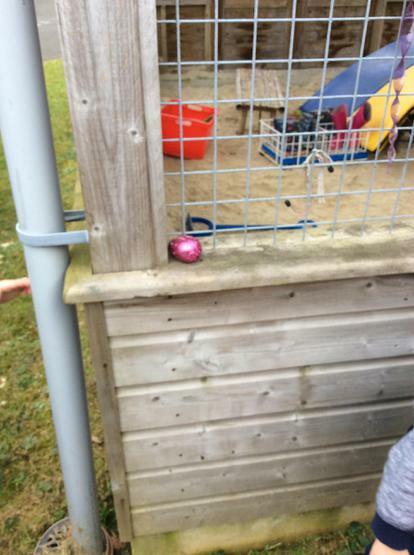 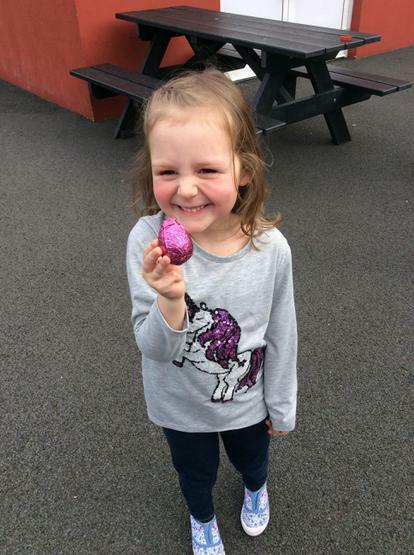 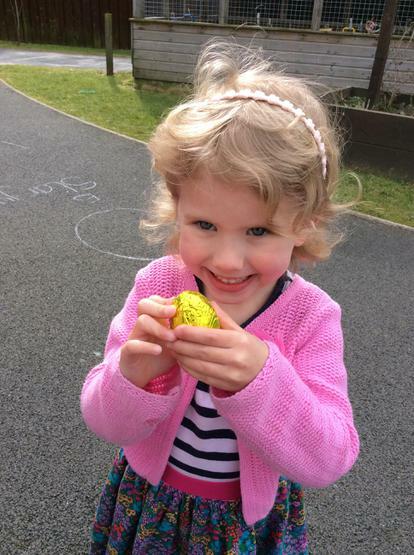 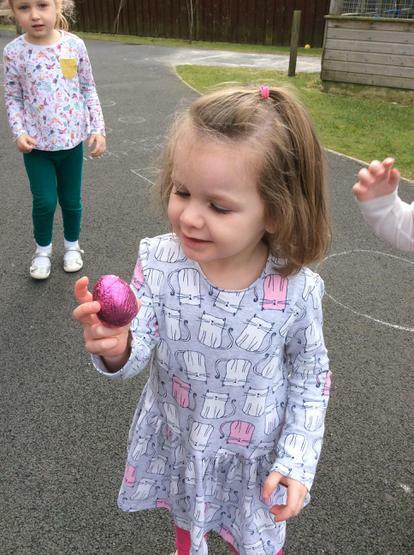 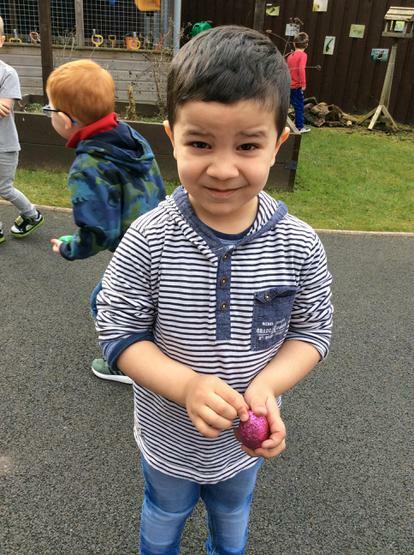 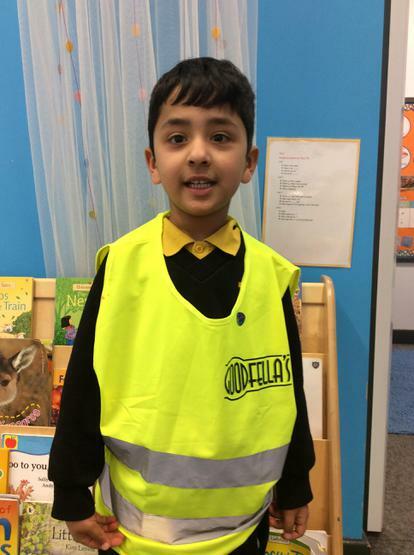 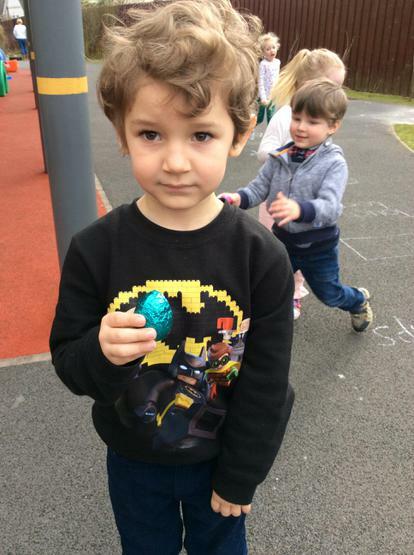 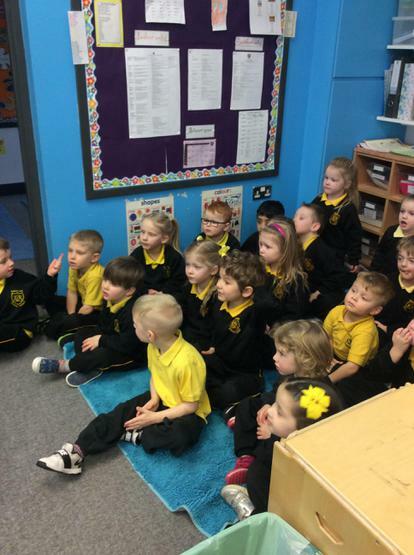 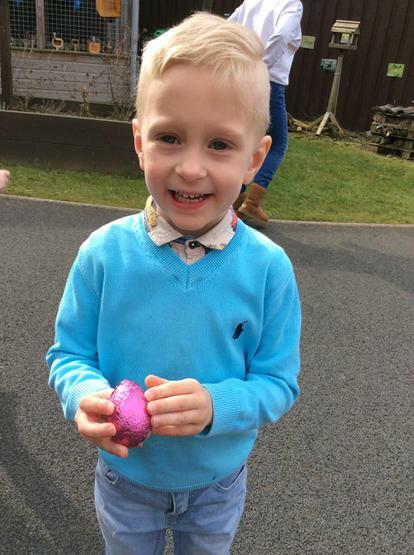 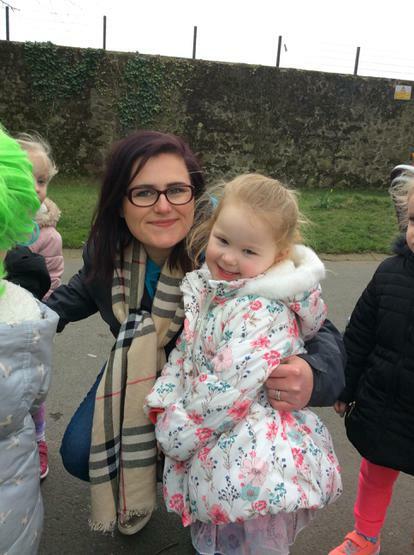 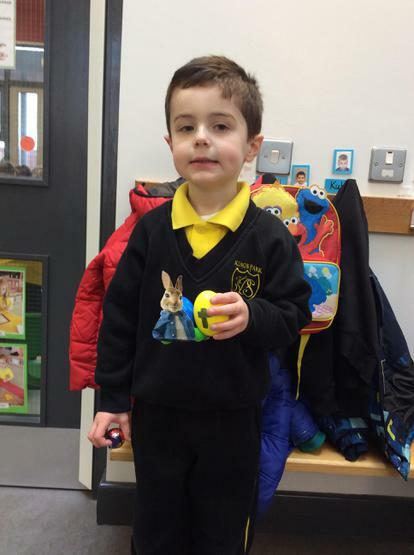 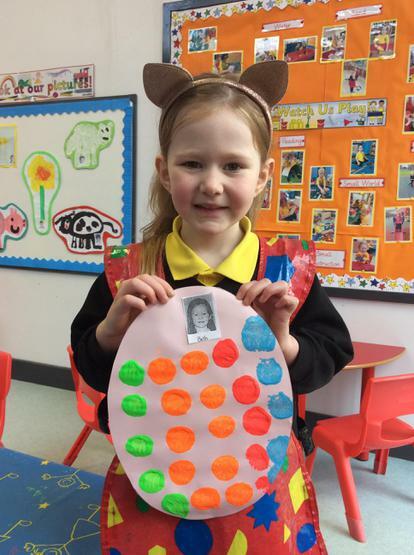 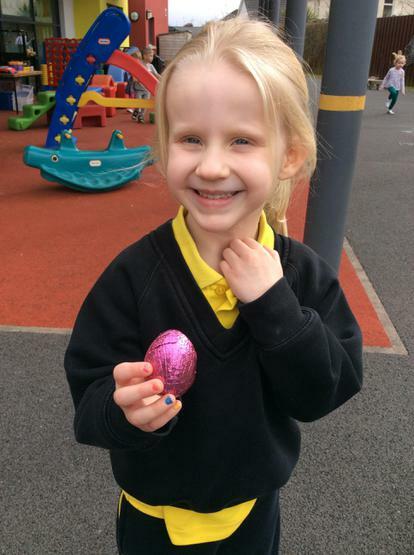 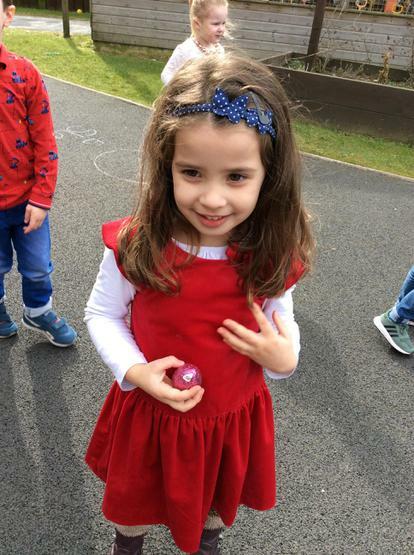 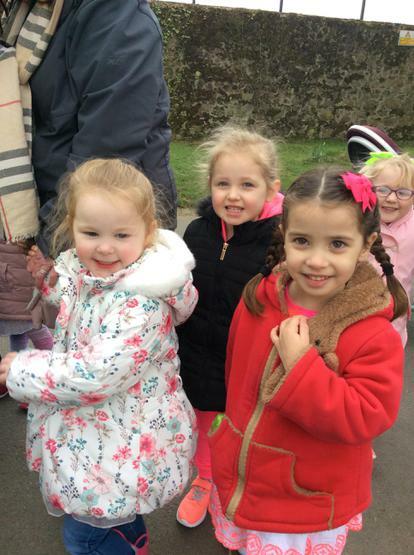 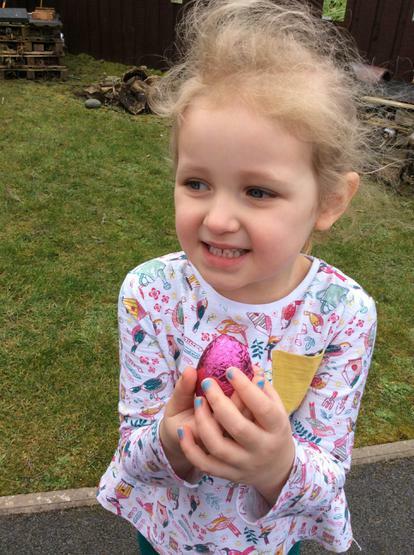 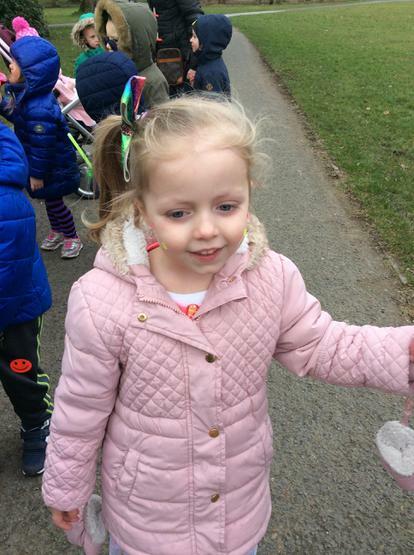 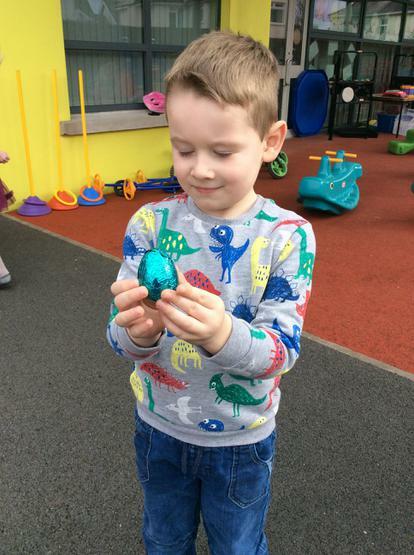 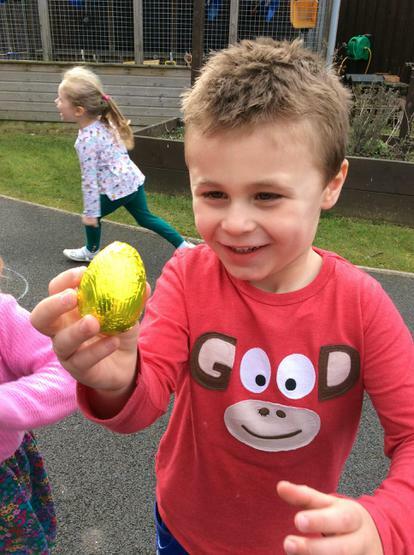 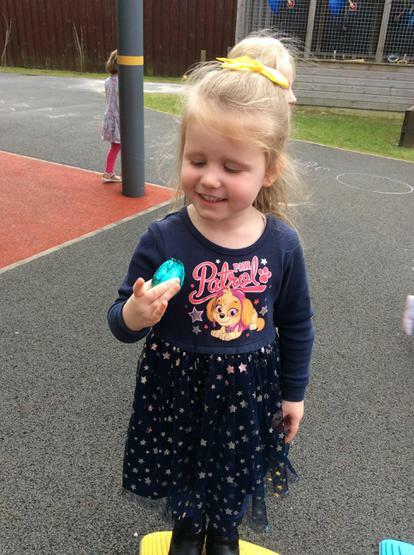 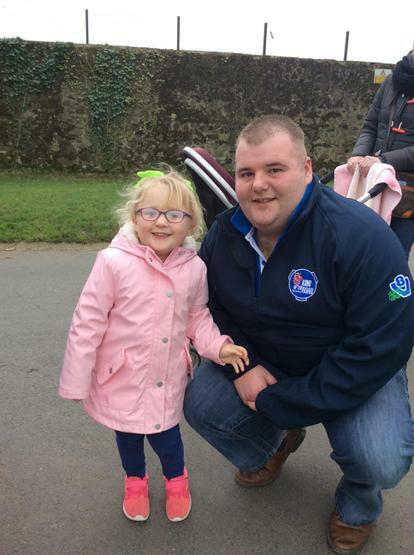 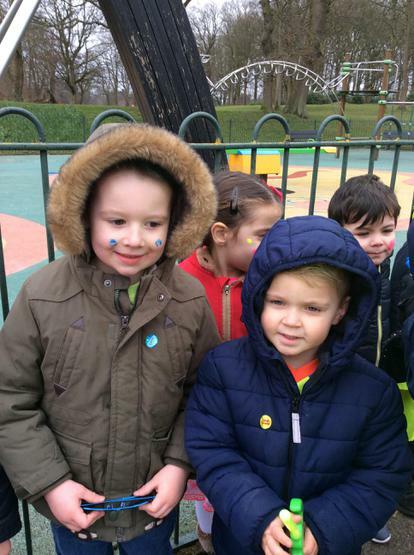 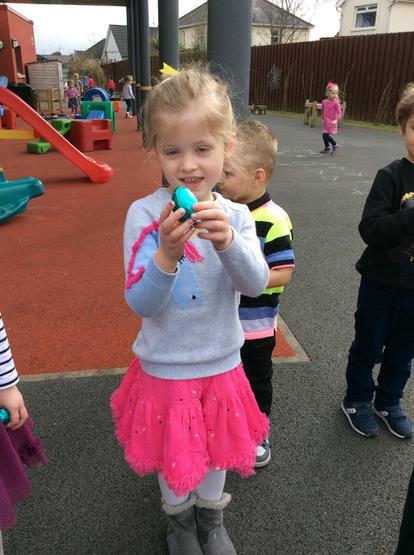 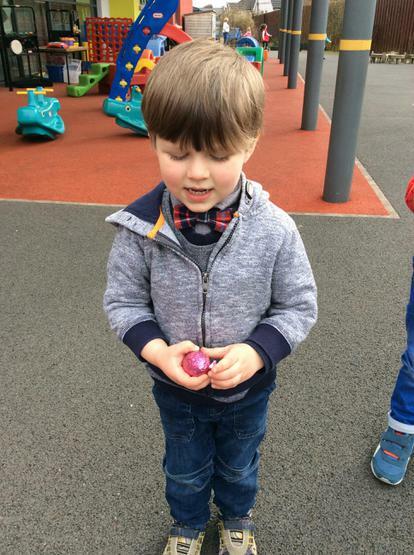 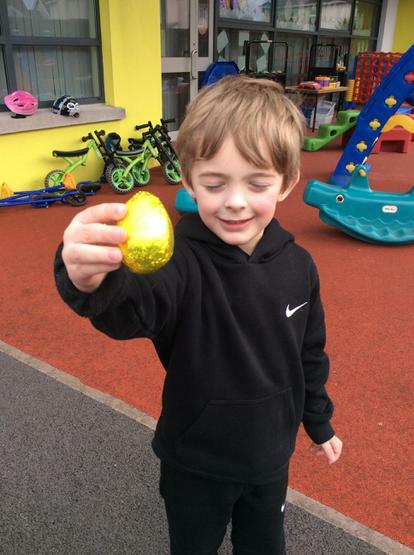 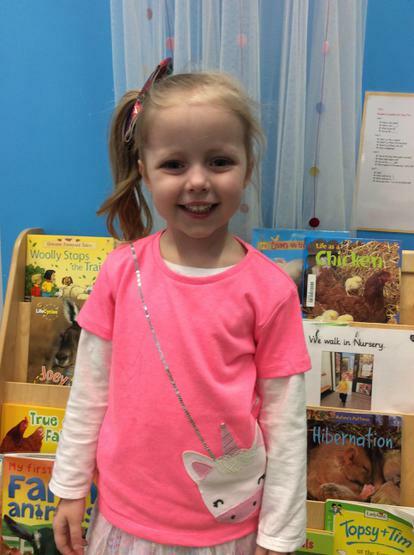 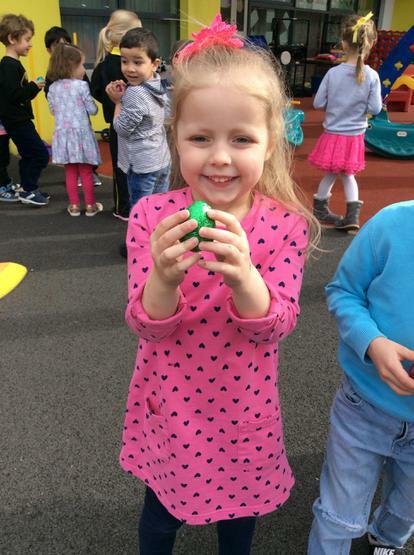 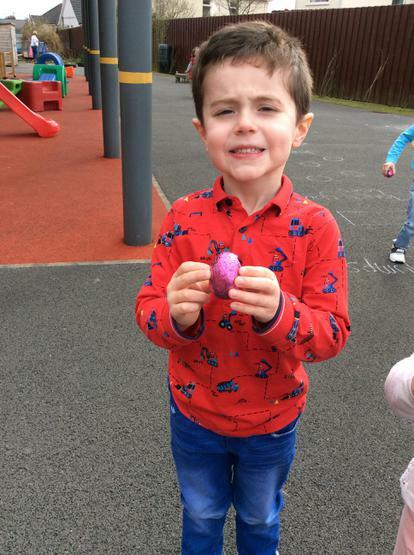 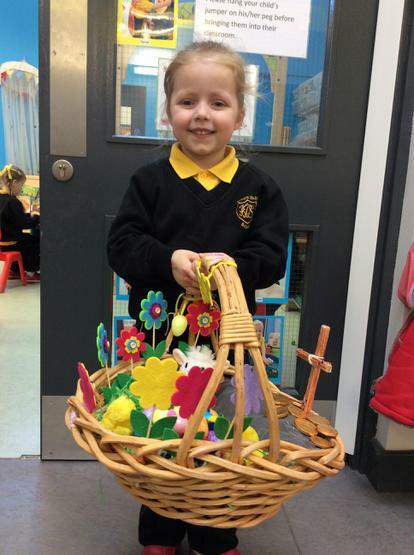 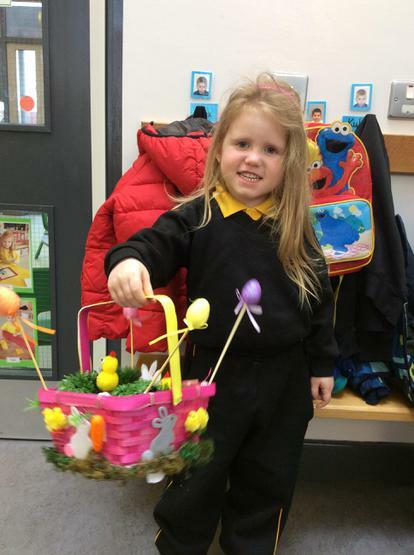 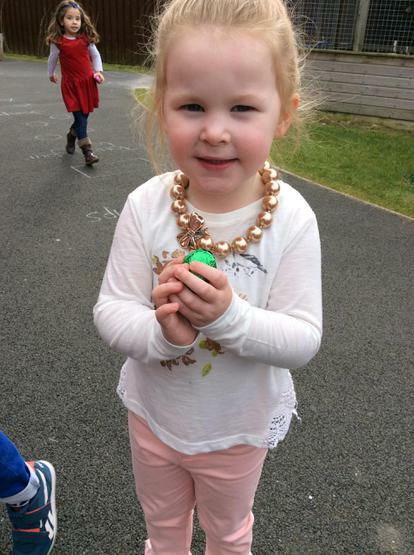 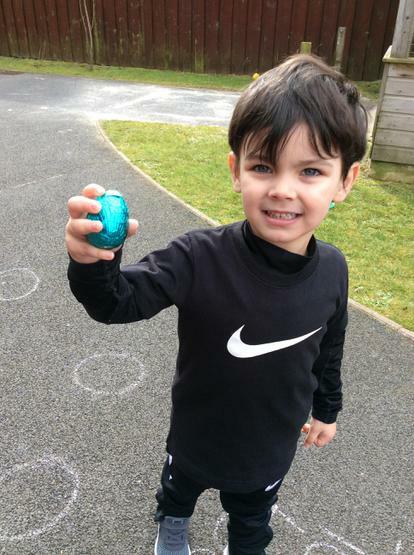 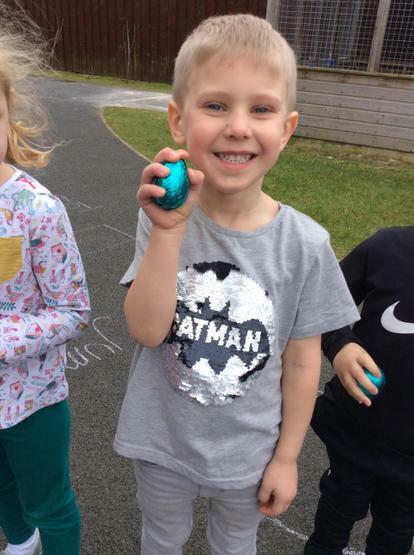 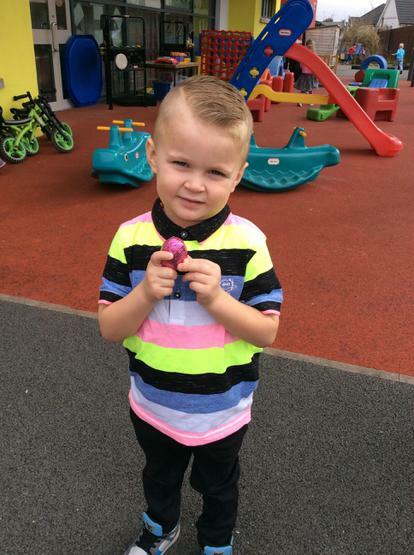 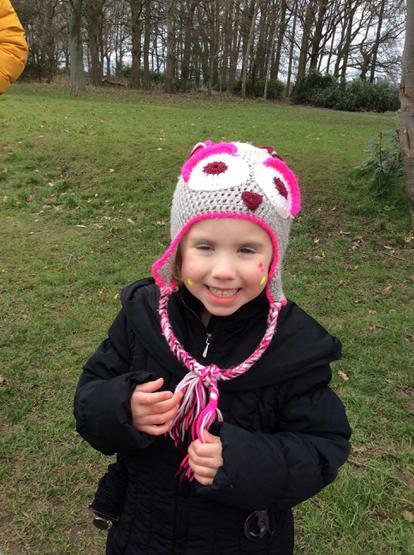 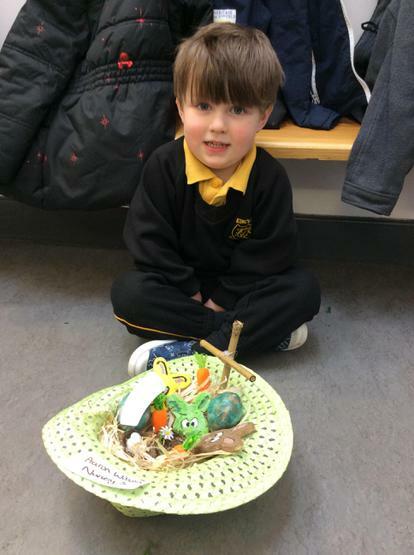 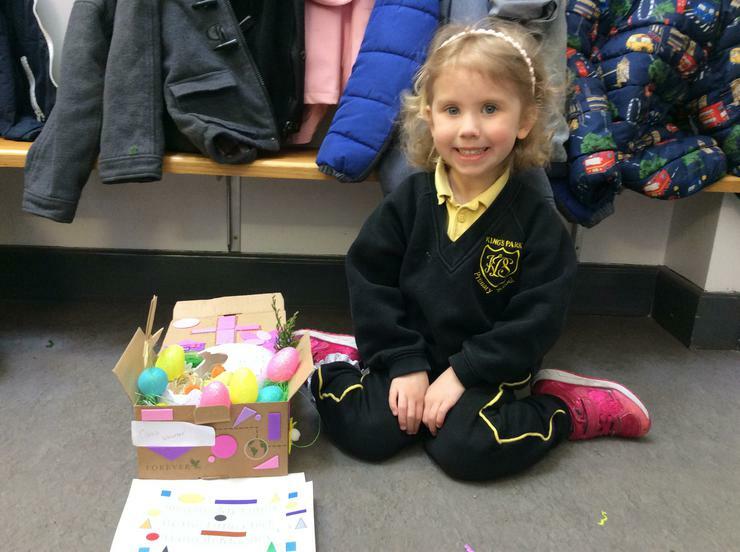 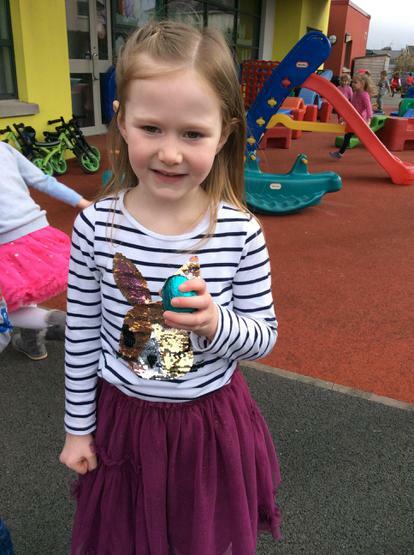 We all enjoyed taking part in an Easter egg hunt!